Click here to return to the main Pictures index. Click here to return to the main 2009 General Piccies Page. Click here to go back to Scotland 2009 Page 1. Click here to go back to Scotland 2009 Page 2. 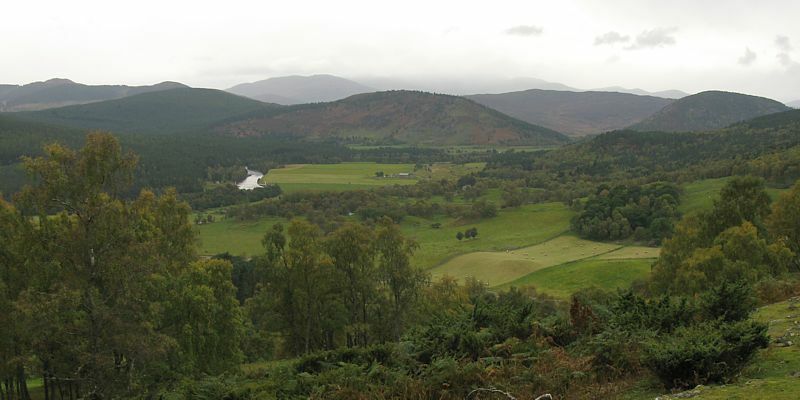 Click here to go to the Aboyne 2009 page. 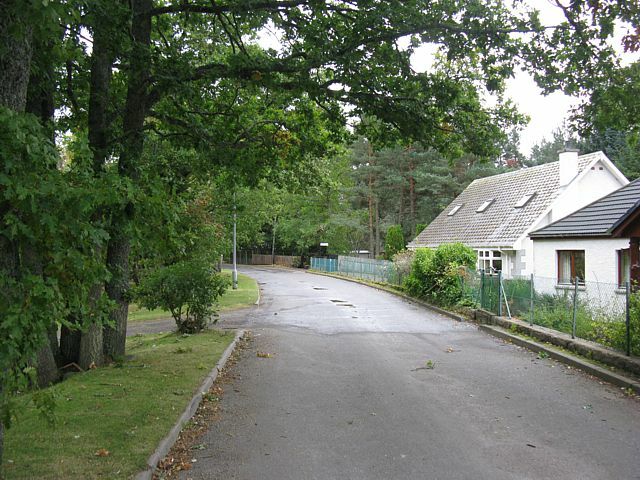 I returned to Aboyne in October 2009. Like in 2007 I decided to make a holiday of it. I left after work on 1st October, stayed in Carlisle, and then over to Fort William via Oban on the 2nd. 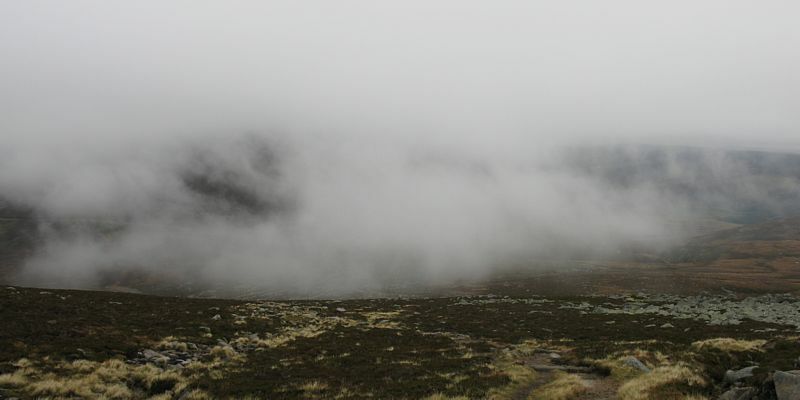 On Saturday 3rd a storm blew through but I still managed to do a very soggy 7 mile walk in the hills above Kinlochleven. Then on Sunday 4th it was calm and sunny. 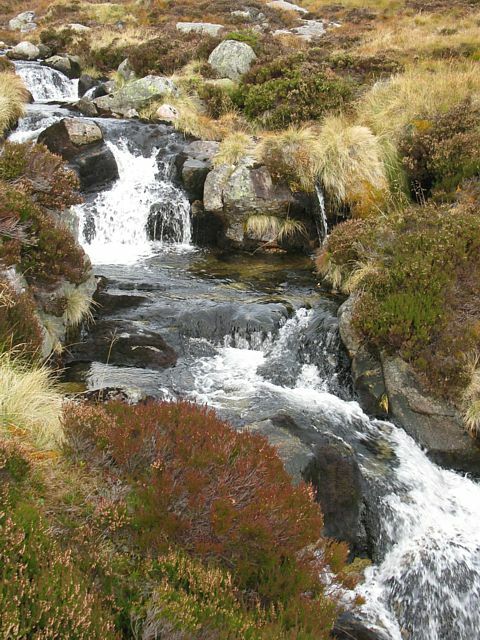 I attempted the Ring of Steall walk and although I didn't quite complete it I did walk atleast 10 miles and had a great, albeit exhausting, day. 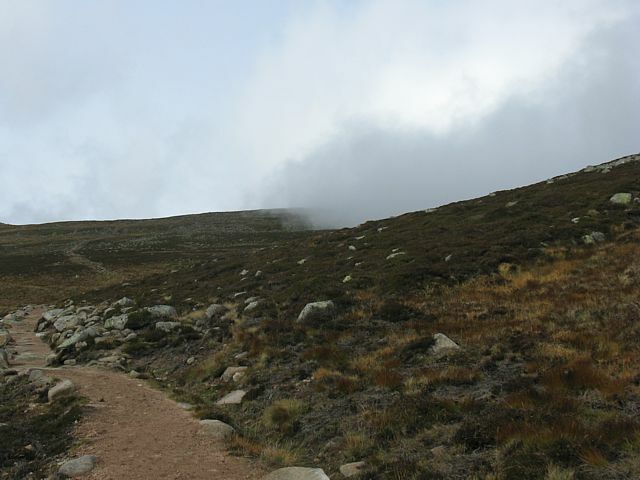 On Monday 5th I transferred to Aviemore and walked to the summit of Cairngorm while it had a snow cap. Good view from the top. 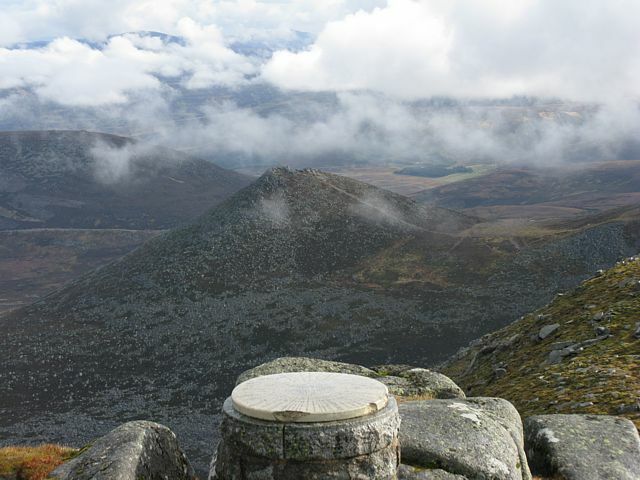 On Tuesday 6th I went to Glenmore and walked to Ryvoan Bothy and then back via the summit of Meall a' Bhuchaille. 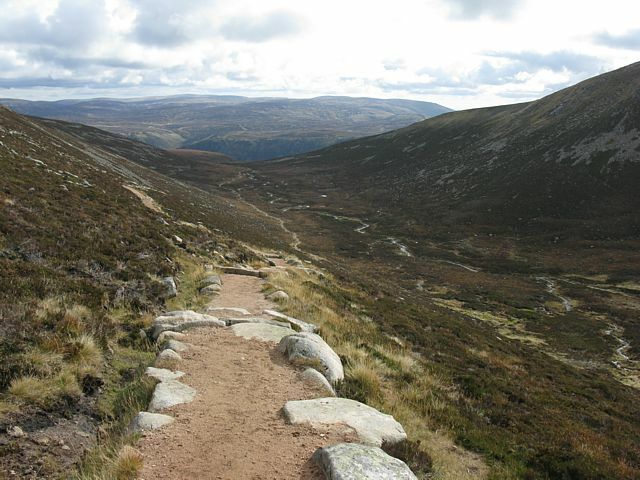 Then after a rest back at Aviemore I explored Craigellachie nature reserve and ended up walking up to a lookout point above Aviemore. 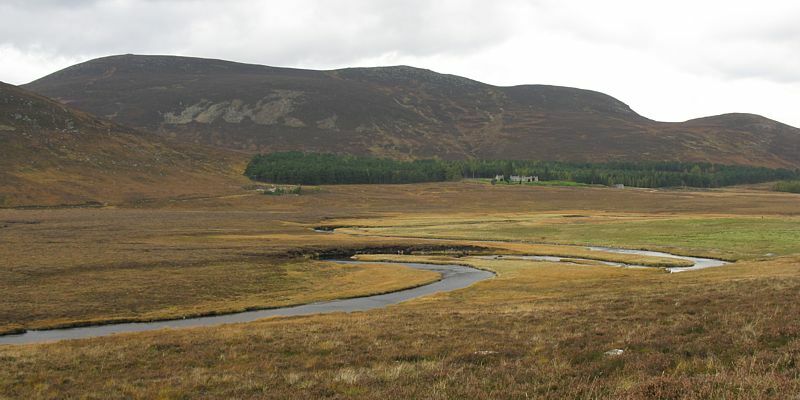 After all that walking I was fairly wasted, so on Wednesday 7th I took the steam train to Boat of Garten and then walked the 5 miles back to Aviemore. Then I rested for the rest of the day. 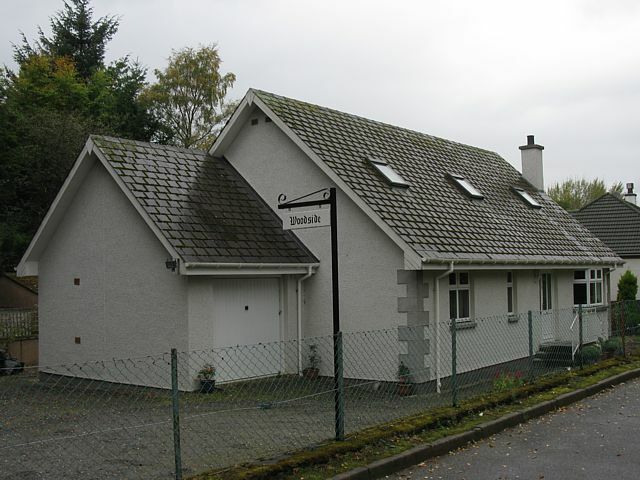 Then Thursday 8th was transfer day to Ballater. 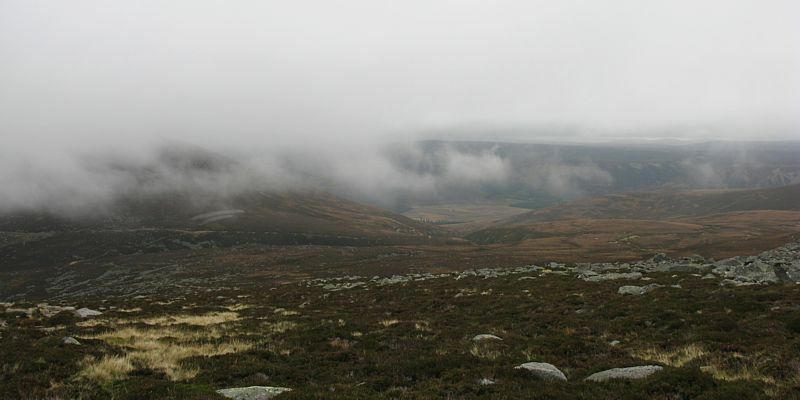 I made a driving trip out of it, exploring as far as Braemar and Linn of Dee before an early finish at Ballater. 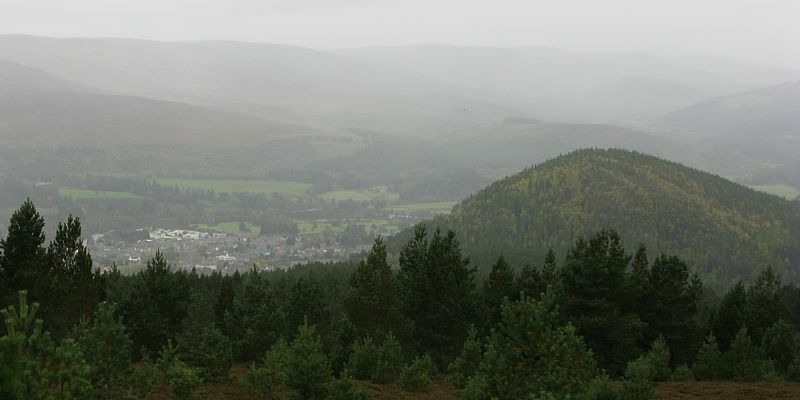 On Friday 9th I did a 7 mile walk above Ballater in windy and damp conditions. Then on Saturday 10th I transferred to Deeside Gliding Club. On Sunday 11th I did have a good wave flight to 20,000 feet. 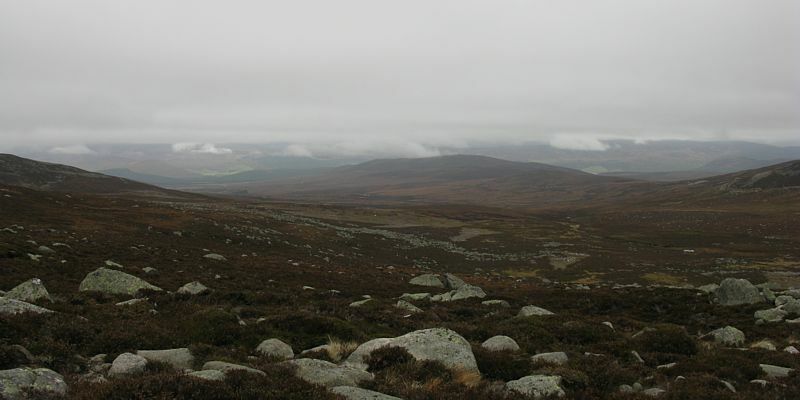 But on Monday 12th it was calm and I had an awesome walk up to the summit of Lochnagar. Tuesday 13th was damp and unfliable. 14th was also not soarable but the gliders did fly. 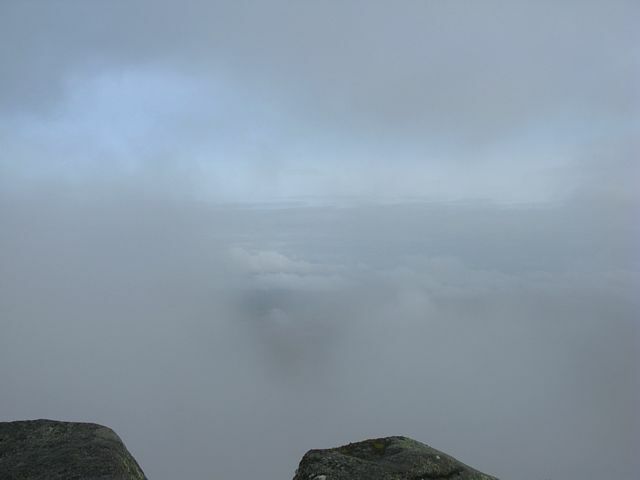 Thursday started off damp and low cloud, but a gap opened up mid afternoon and I soared to 7000 feet before the gaps in the cloud closed on me. I did managed to descend through a closing hole though and land safely before rain arrived. Then Friday 16th I flew a single seater. I fell down onto a ridge at 1500 feet before thermalling up and connecting with wave and peaking at 19,500 feet. Very satisfying that was. 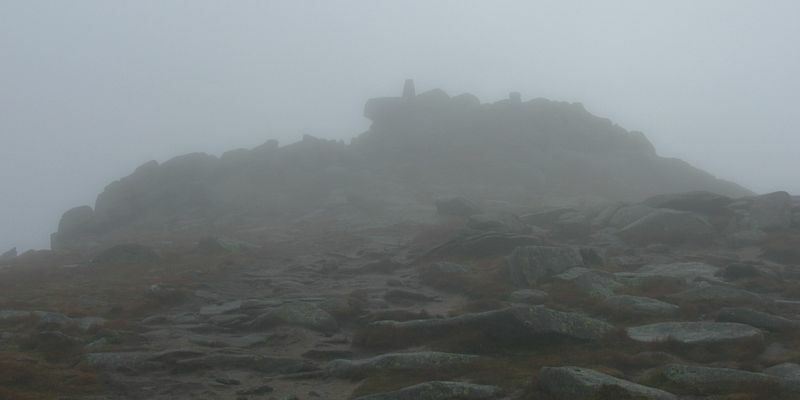 I came down mid afternoon as the clouds reduced as high pressure dug in. Pressure was almost 1040Mb today so FL195 was higher than usual too. Then on Saturday 17th I started my journey home. Photos 9th October 2009 - Sgor Bhuide Circuit. 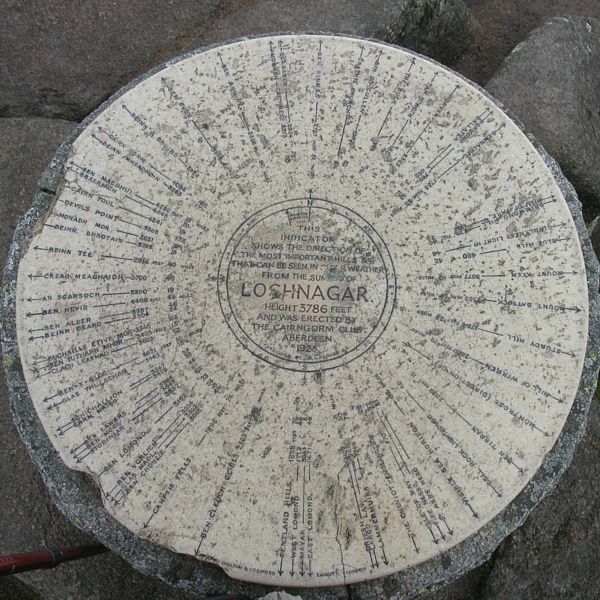 Unfotunately the original of plan of climbing Lochnagar today was no go as it was way too windy and generally unpleasant. 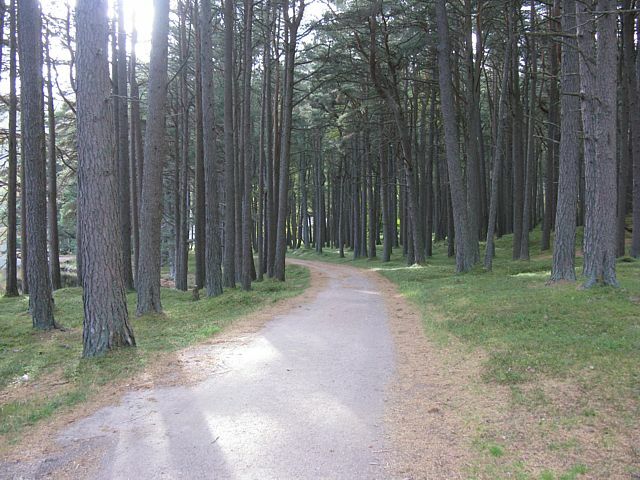 I did want to get walking again, having rested a bit the last day or so. So I decided to to the Sgor Bhuide circuit, especially as it was within walking distance of the BnB. 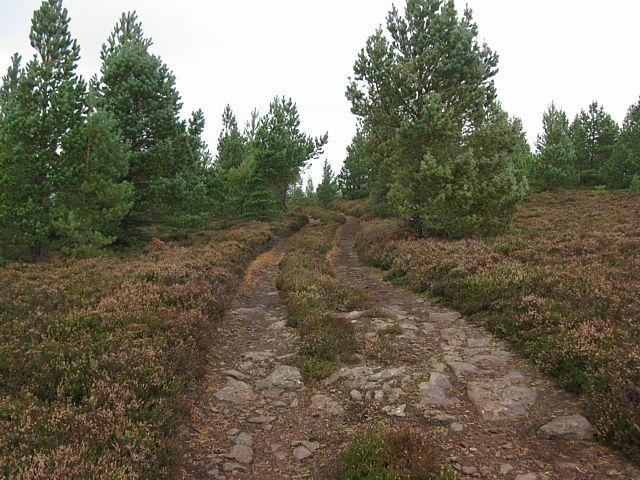 I started at the old royal station platform, and followed the yellow markers until I reached the B972 Pass of Ballater. 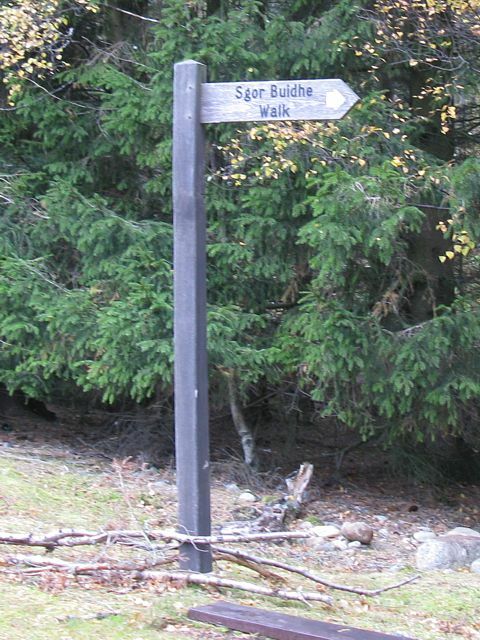 I walked along the road Eastwards until I found the Sgor Bhuide sign which took me on a steep diagonal track up the hill. 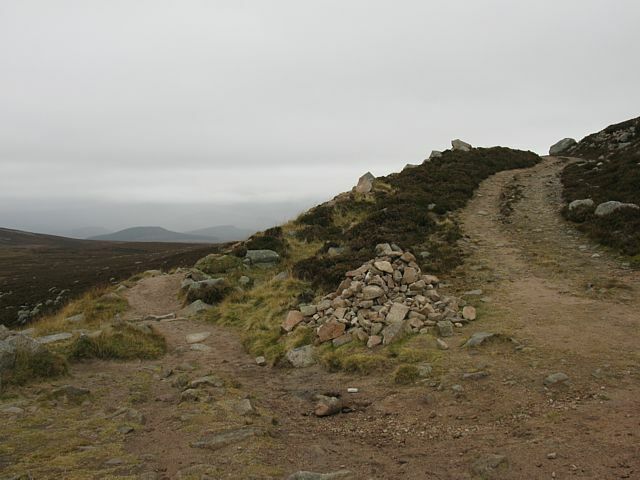 I followed the track as it wound up onto the Craigan Riabhach ridge. The track spiralled anticlockwise. 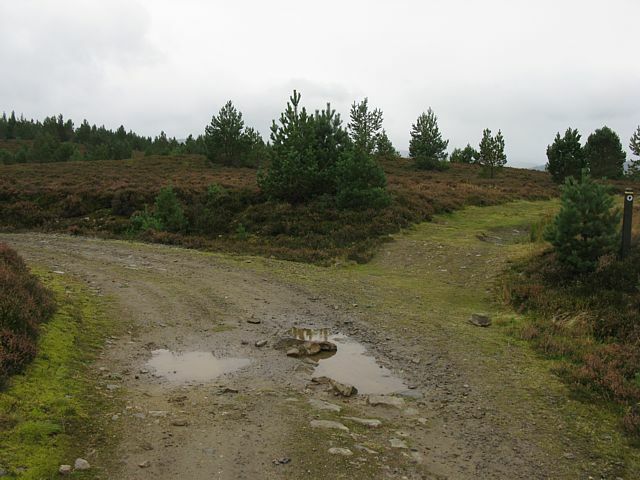 Where it turned sharply East to a transmitter I carried on Northwestward to the top of the ridge. 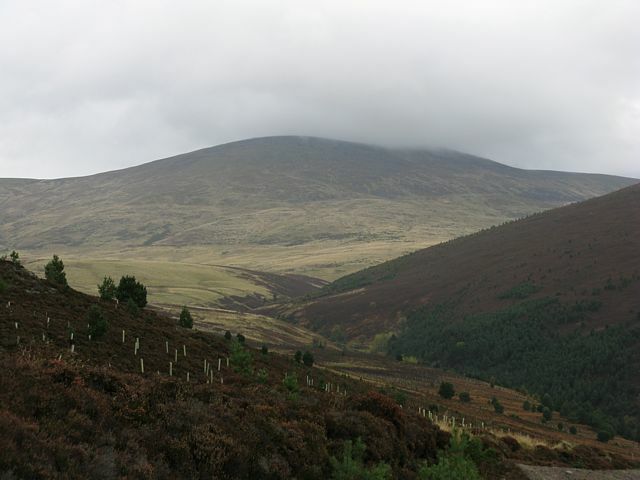 The highest point above the forest at 547 metres was exposed heather with a great view of Morven to the North. Up here it was blowing a hoolie and persistent drizzle. 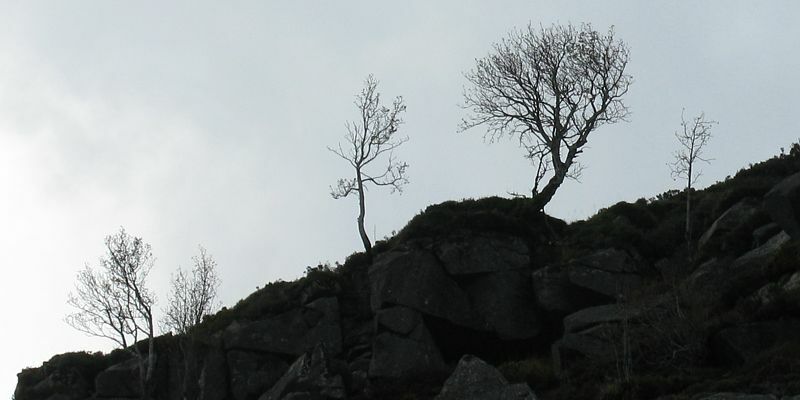 I soon started to feel quite unpleasant and was glad to retreat back down below the tree line below Craig of Prony. 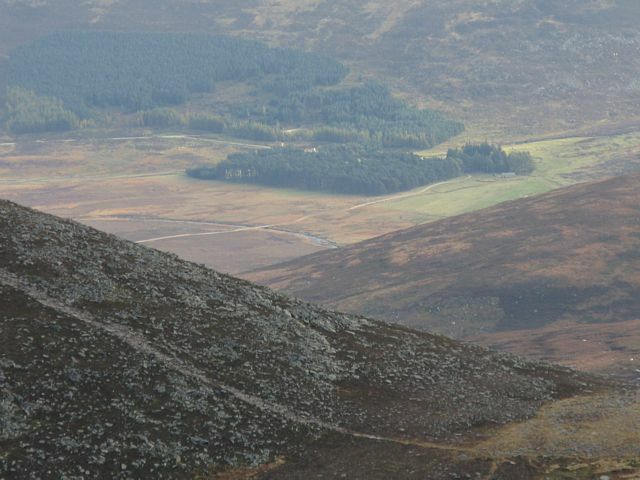 I did have a good view over the top of Craigendarroch and to a suspension bridge a little way upstream. From there it was a straight forward track down back to the road, and across to the old railway path. By then I had slipped a few times and feeling tired. 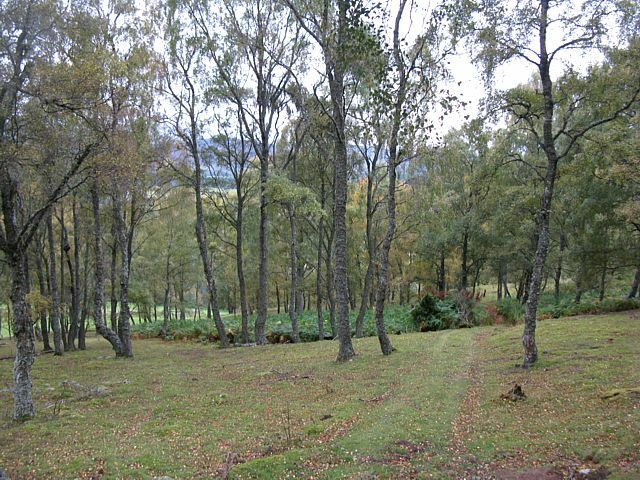 I followed the path back to Ballater only to discover the BnB was on the old railway line. Nice! So there ended the walk, and I was finished for the day. The Sgor Bhuide sign from the B972. The B972. 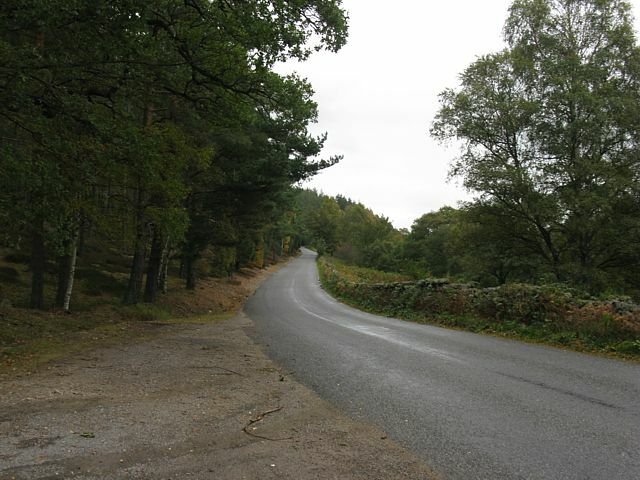 The track up the hill to the transmitter. 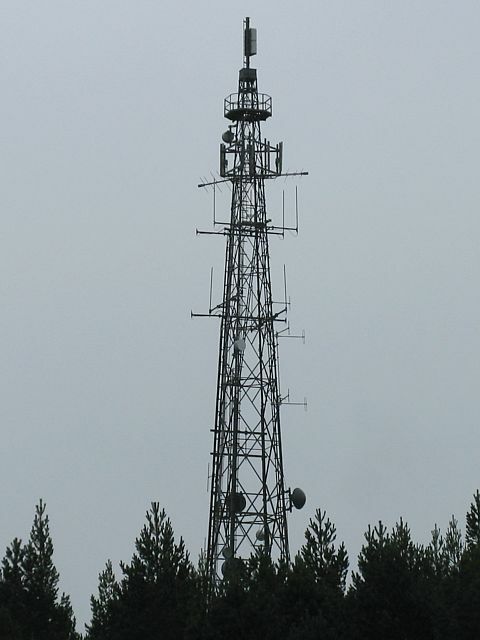 The transmitter. 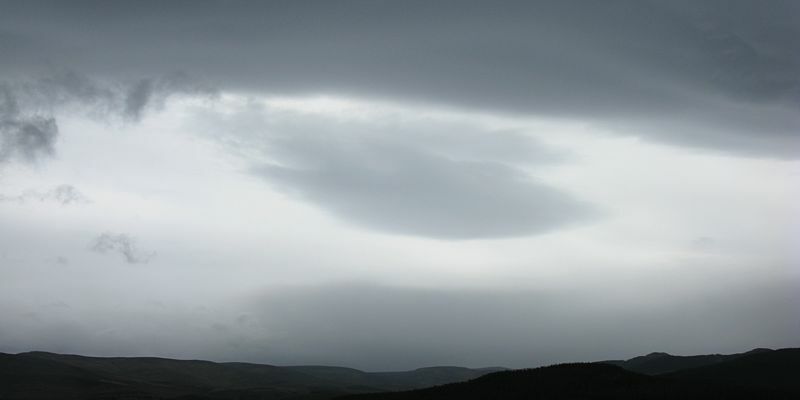 Morven already looks impressive to the North. The fork off the track. I turned right here to go up to the ridge top. 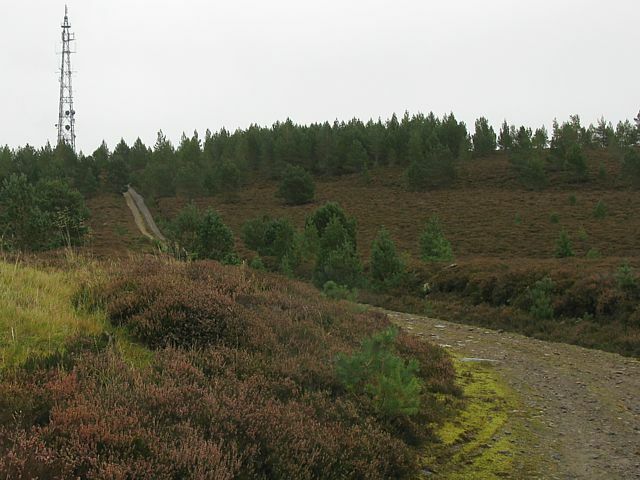 Looking further along the track to the transmitter. 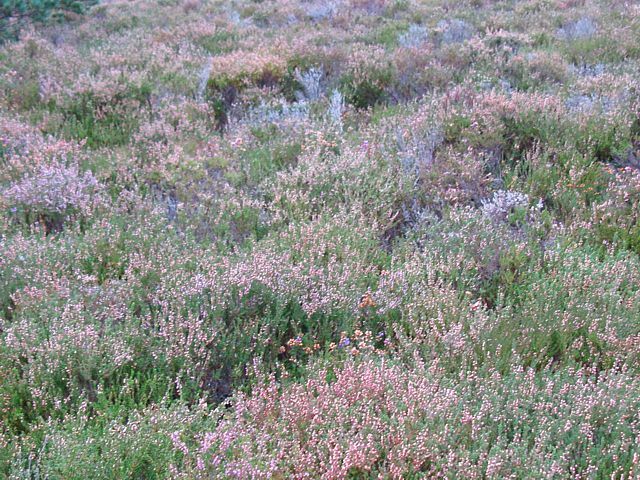 The heather here was pretty lush. 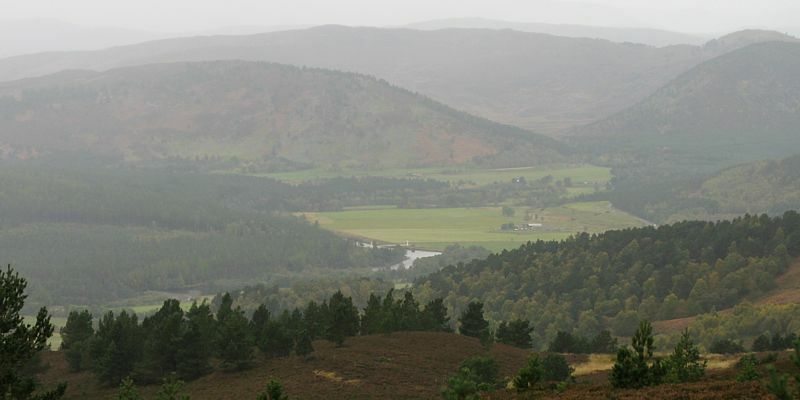 Looking down over Craigendarroch to Ballater, and further up Glen Dee. Following the rough track to the ridge top. 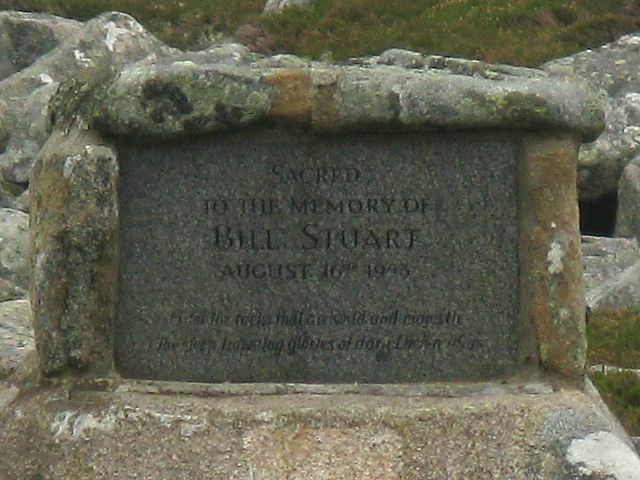 The stone marking the highest point at 547 metres. A 6 shot panorama looking North. 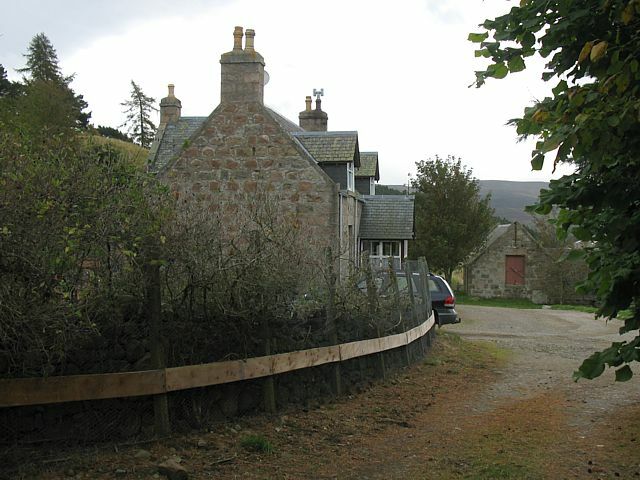 Morven sits behind Peter's Hill at this angle. 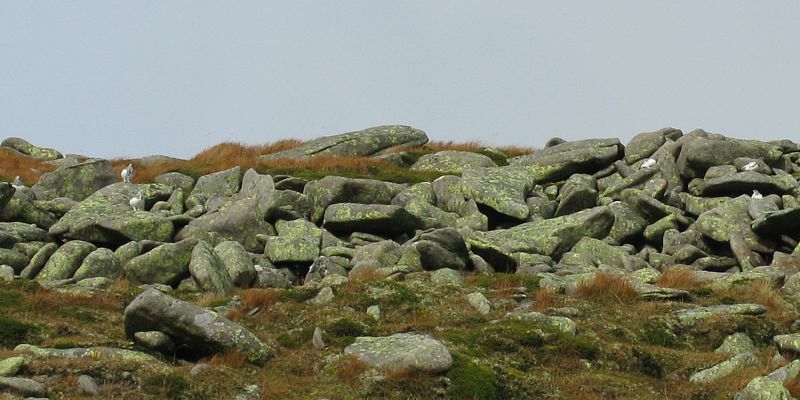 Another rock pile on the Western edge of the ridge top, just before the path descends down to the Southwest. Descending below the tree line. 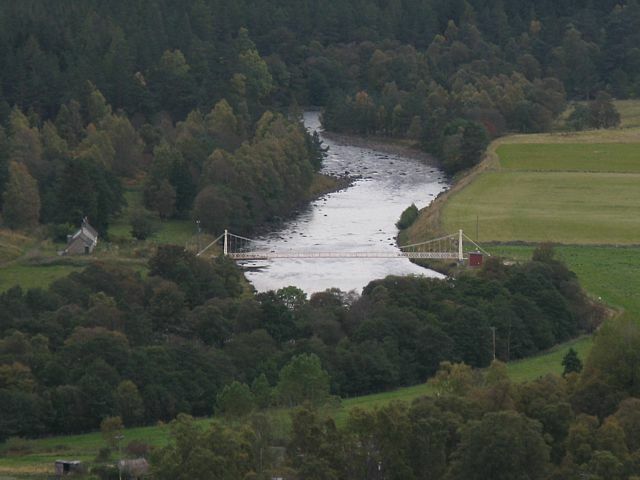 At this point I got a good view of the suspension bridge upstream of Ballater. What's this? 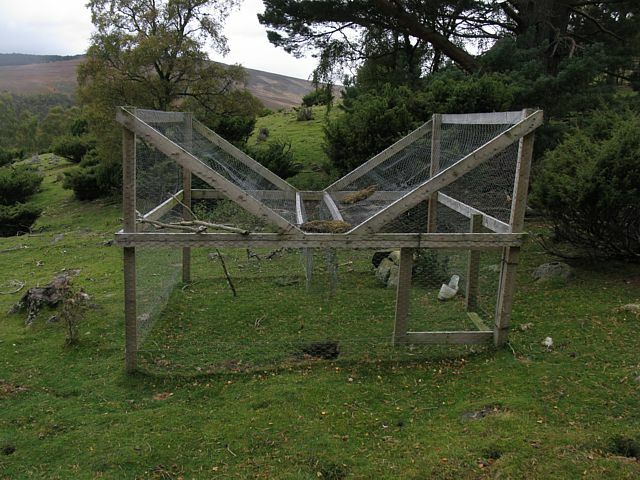 A trap of some sort? 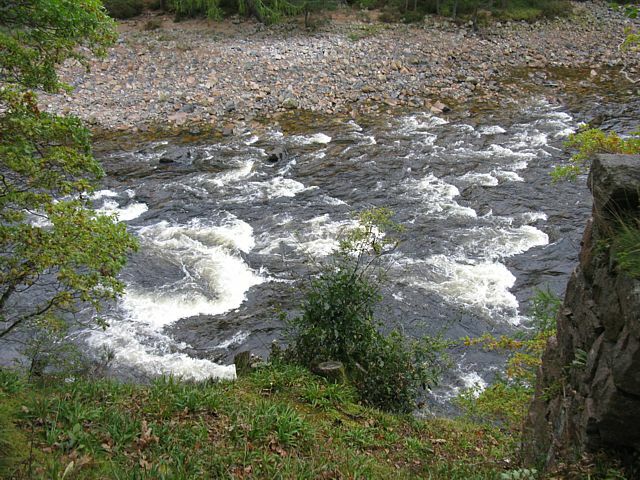 A wider view upstream. the worst of the weather started to clear. Wave bars can clearly be seen in the gap in the darker shot. Passing a farm building on the way back to the road. 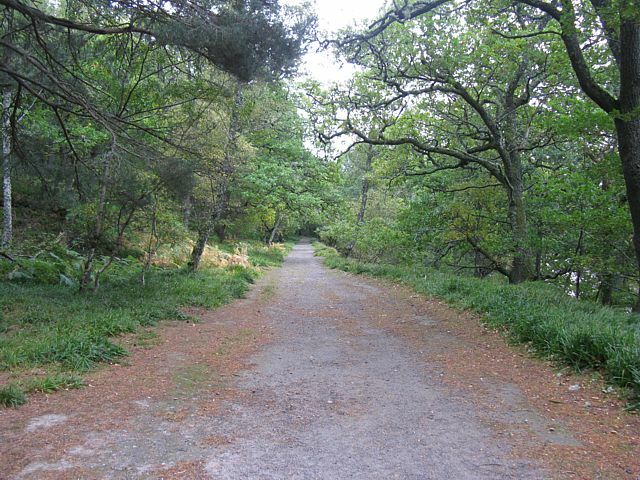 Walking along the old railway line path back to Ballater. 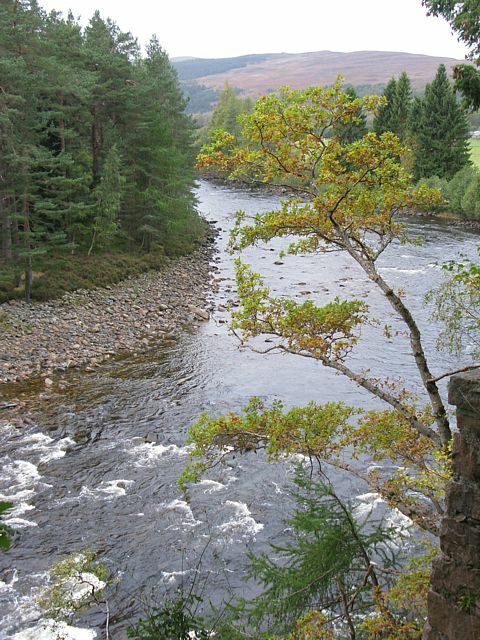 The river Dee looked pretty picturesque from here. 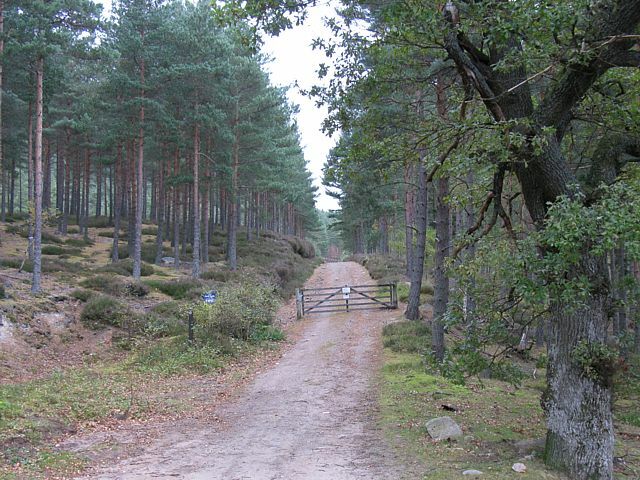 The path becomes Old Line Road where the BnB is. Also a nice view of surrounding houses too. 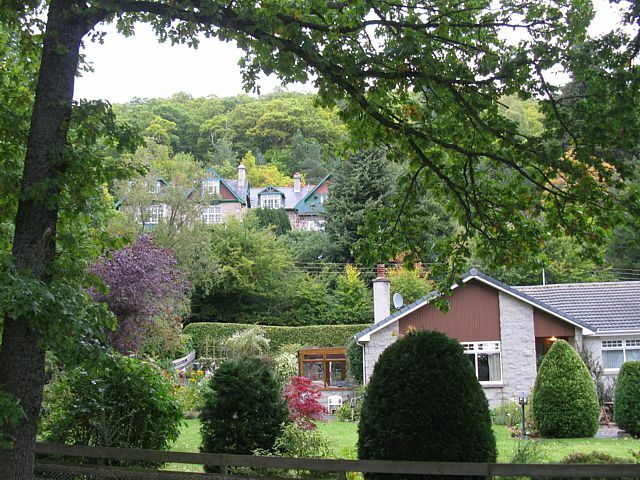 Woodside BnB. 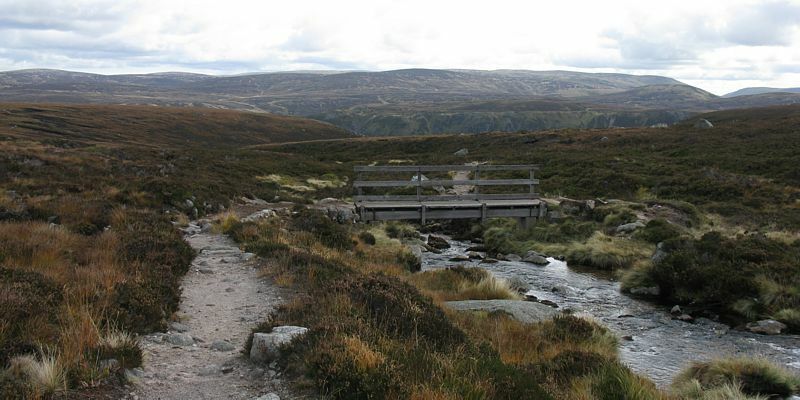 Photos 12th October 2009 - Lochnagar. After yesterday's decent wave flight today a ridge of high pressure was going through, and the bottom 5000 feet of atmosphere looked to be calm. 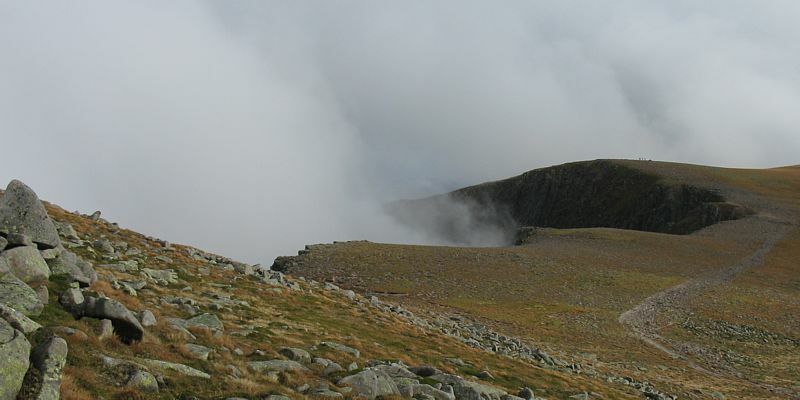 I saw this coming and decided that today was a good alternate day to walk up Lochnagar. 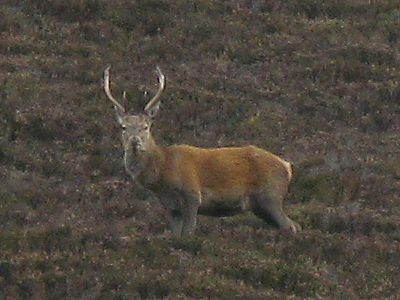 I got up early, and by daybreak I was already headed south along the road to Spittal of Glen Muick. I got there around 7:30AM and was walking by about 7:45AM. 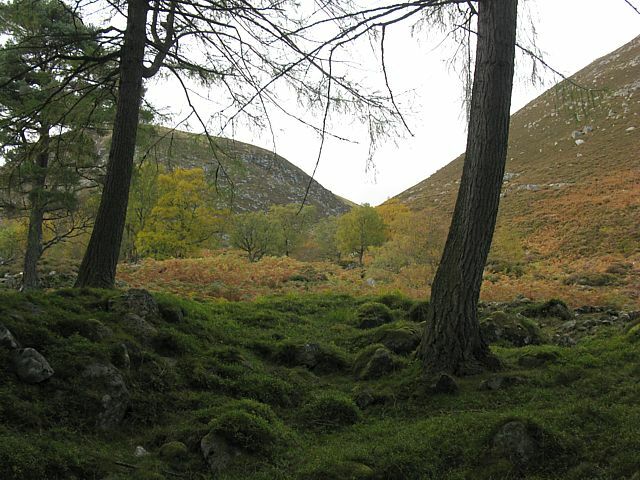 I set off across Glen Muick to a wood at Allt-na-giubhsaich. 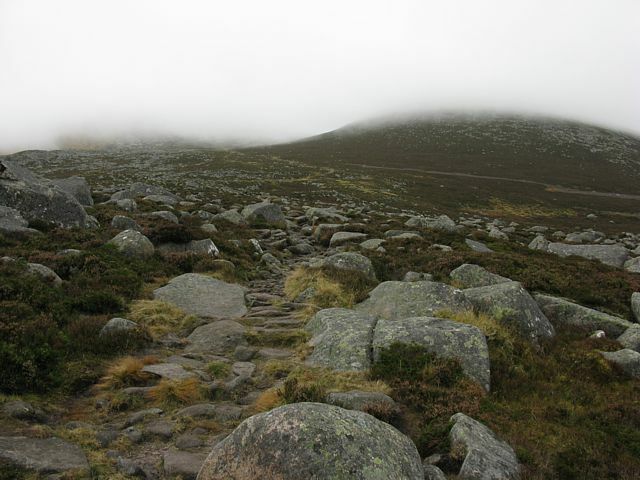 The track continued up the glen towards a cloud shrouded Lochnagar, passing a gorge called Clais Rathadan. 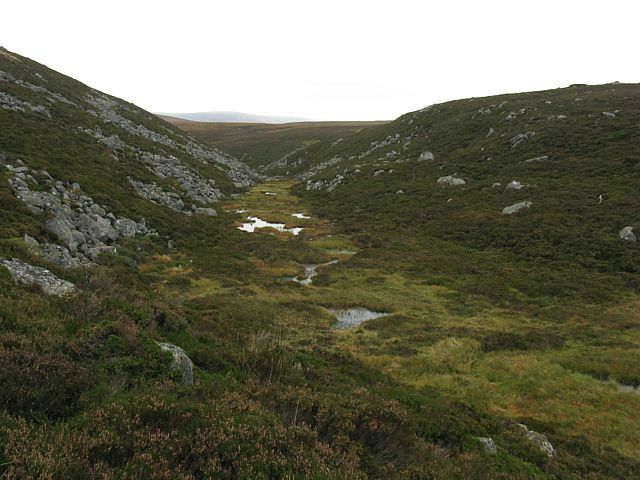 Beyond this I reached the source of the stream, and then the junction where I turned left across the 'Ptarmigan Butts' and then up the slopes of Lochnagar itself. 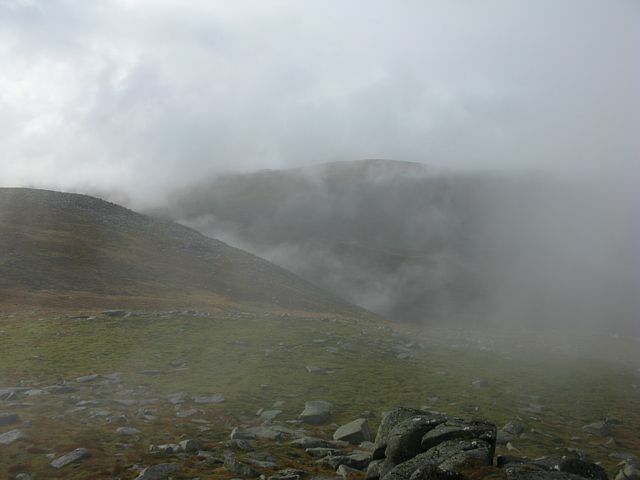 After passing the memorial at 850 metres I soon reached the base of the stratus layer at 900 metres. 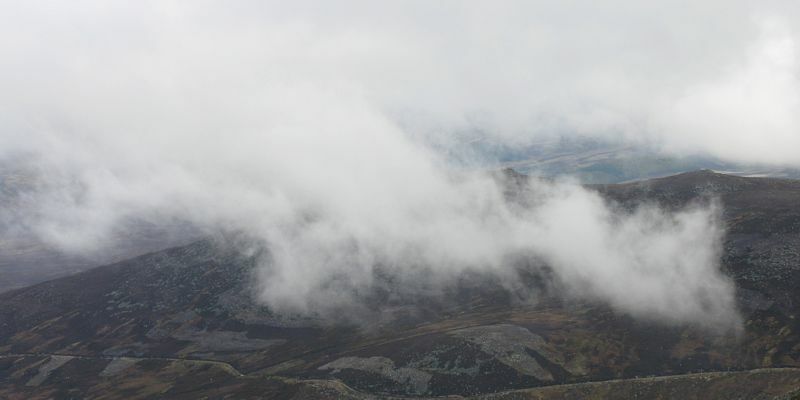 I was in cloud by the time I reached the Baleach below Meikle Pap. After a short rest I found and climbed a rocky staircase that took me through a boulder field and up onto the summit plateau. 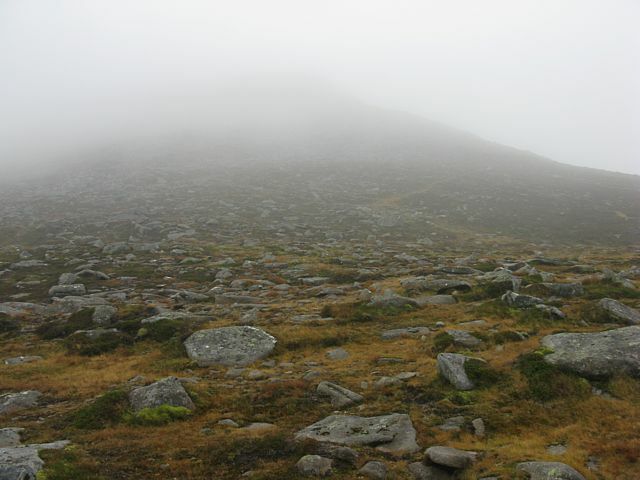 Then it was a simple case of following the path round until I reached Cac Carn Mor and then the summit, Cac Carn Beag. 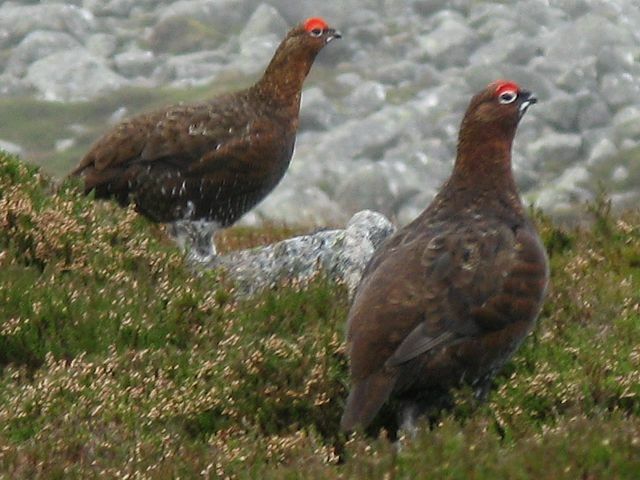 Then while I was standing on the summit, I had a 'wow' moment. The sun started to shine through the cloud. And then rather suddenly, a clearance arrived, and a panoramic vista was unveiled before my eyes. Amazing! I could now see the entire route I had walked from the start. 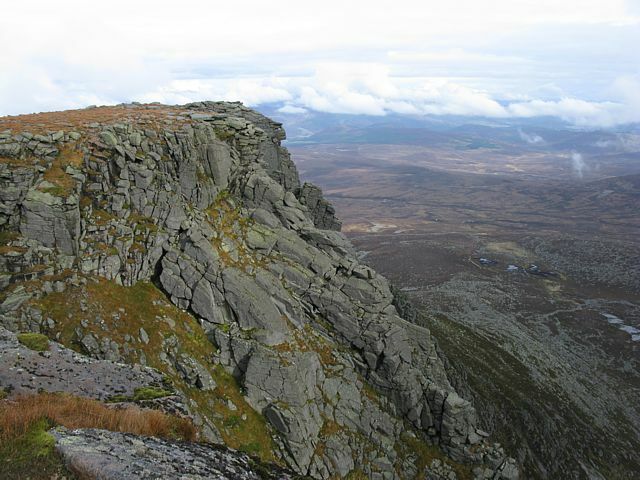 Meikle Pap was well below me and the whole of the summit plateau laid out in front of me like a map. 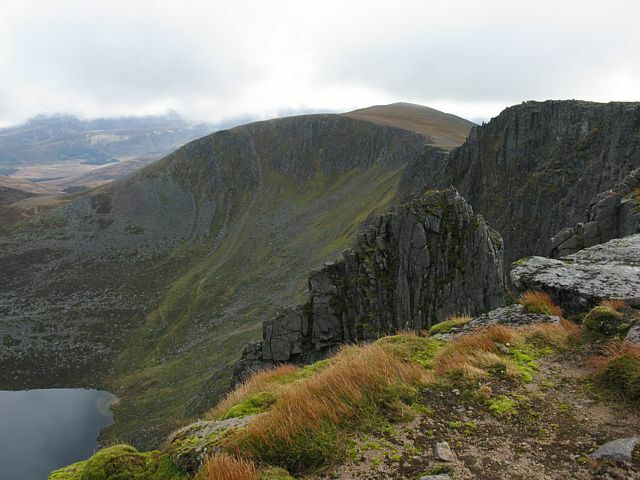 After taking lots of pictures I wandered along the cliff edge back to Cac Carn Mor, and got a great view of Lochnagar itself below the northern Corries. 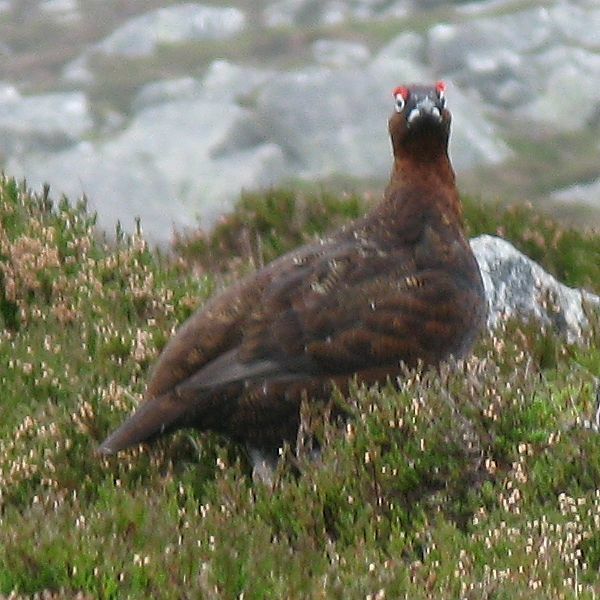 Then as I descended from Cac Carn Mor I got a good view of a flock of Ptarmigans. 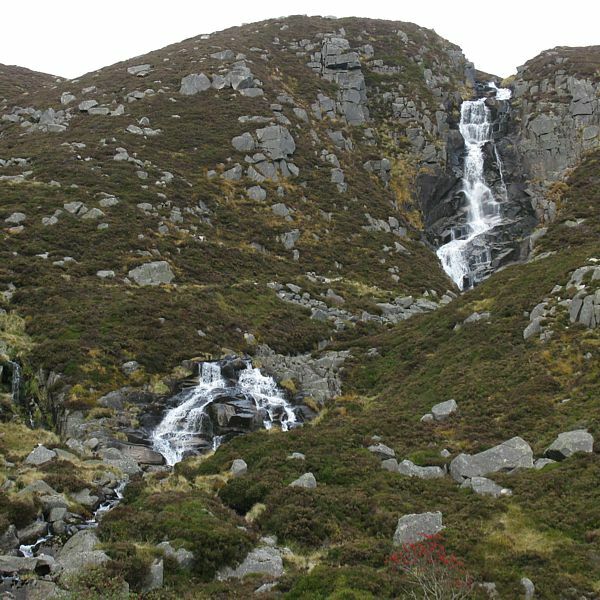 After that it was a straight forward descent along Glas Allt, with a gash in the landscape below being the top of Glen Muick. 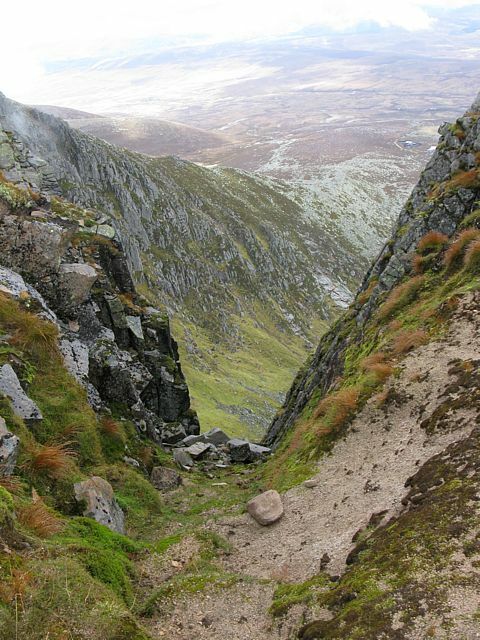 Eventually I reached that gash, where Loch Muick revealed itself below large steep cliffs. 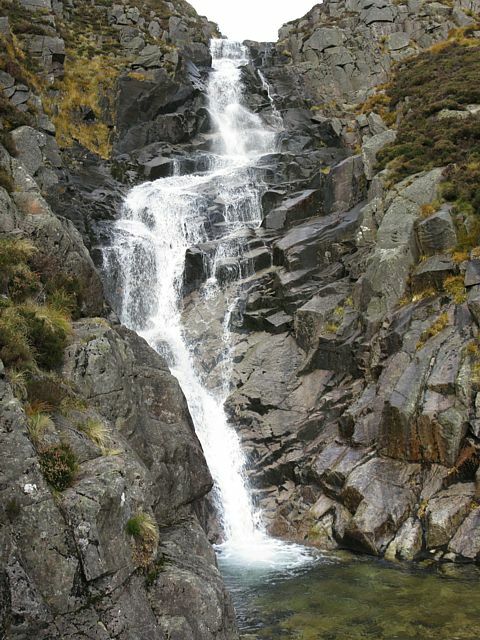 The drop off here revealed the cherry on the cake, the spectacular Falls of the Glasallt. 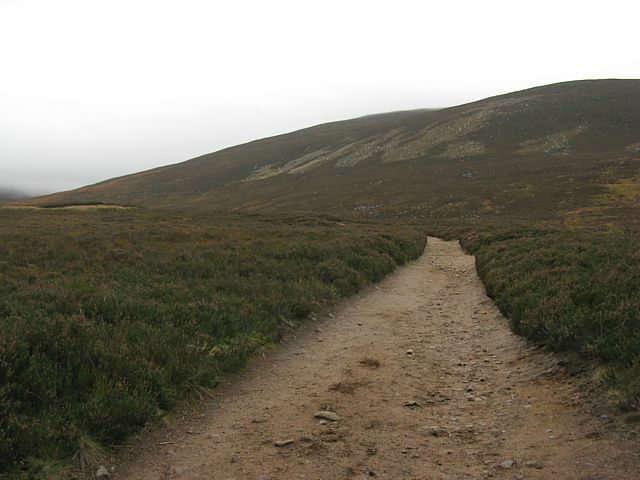 I then descended to Glas-allt-Shiel and walked back along Loch Muick to the start to complete an awesome walk. Then a drive to Deeside Gliding club to murder a cup of tea as I was knackered! Looking across Glen Dee to Allt-na-giubhsaich from Spittal of Glenmuick. 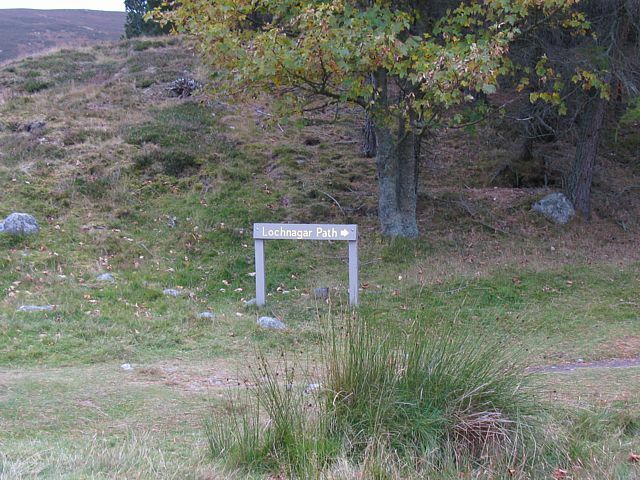 The sign pointing the way up the glen. 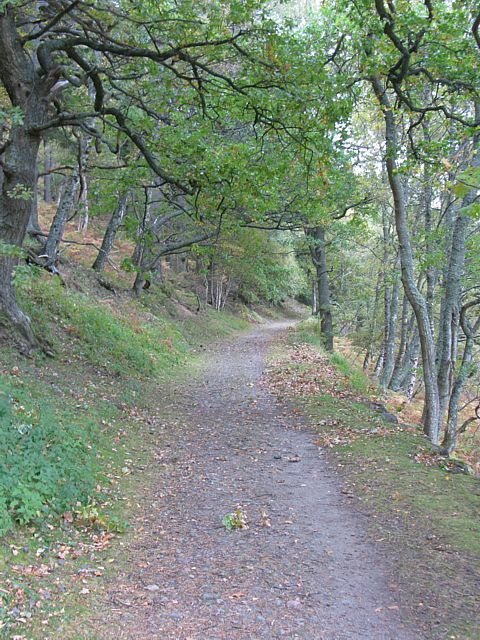 Through the wood at Allt-na-giubhsaich. And out onto heather moorland. 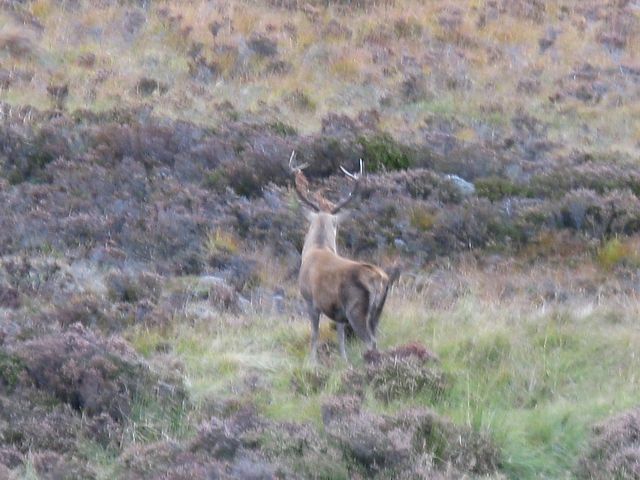 A stag making lots of early morning noise. 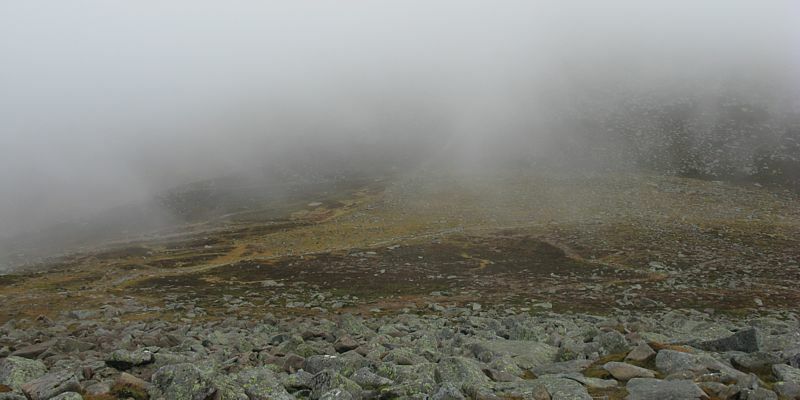 My first view of cloud shrouded Lochnagar. 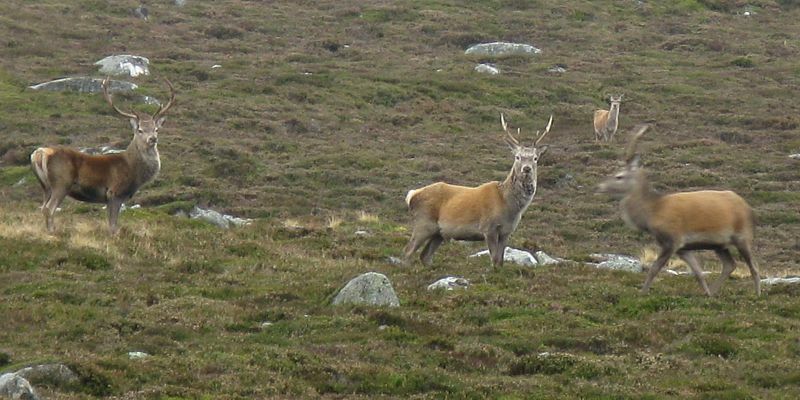 The stag's hareem? 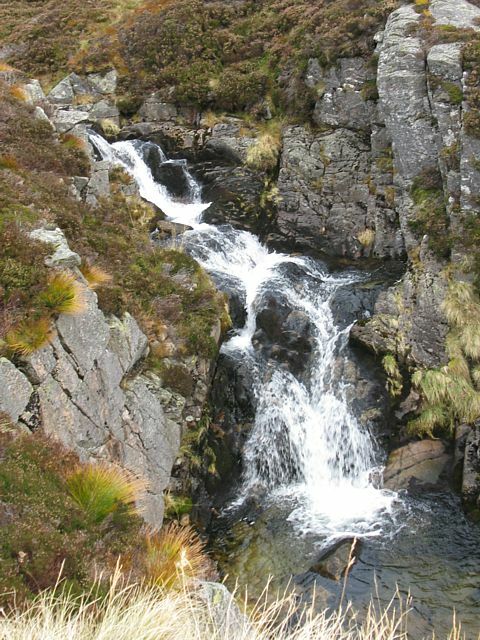 The gorge at Clais Rathadan. The turnoff at Ptarmigan Butts. I turned left here. The source of the stream I'd been following. 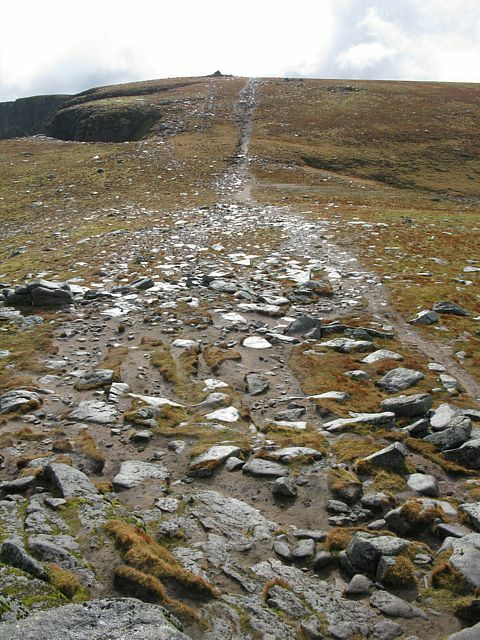 At Ptarmigan Butts the path is fairly rocky. 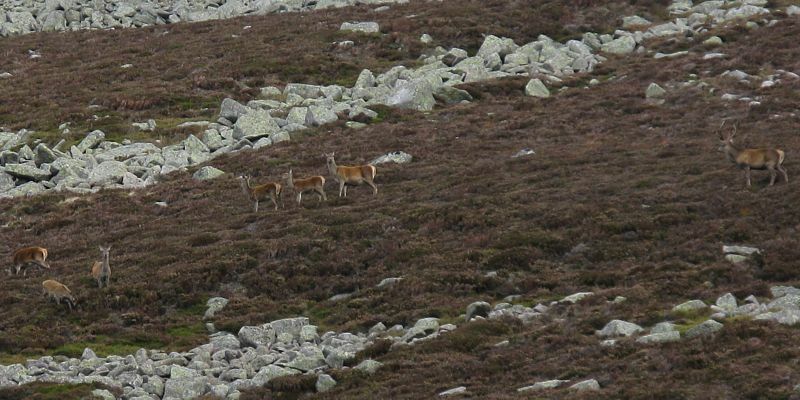 On the slopes of Lochnagar I found more deer. While behind me cumulus base 700 metres started billowing up from Deeside. 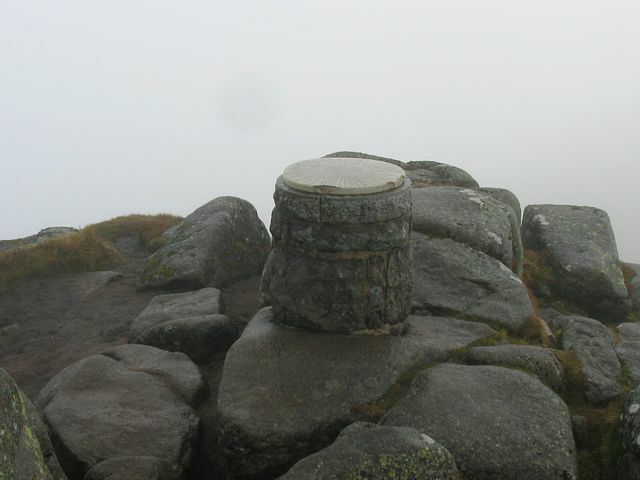 The Fox Cairn Well memorial at 850 metres. 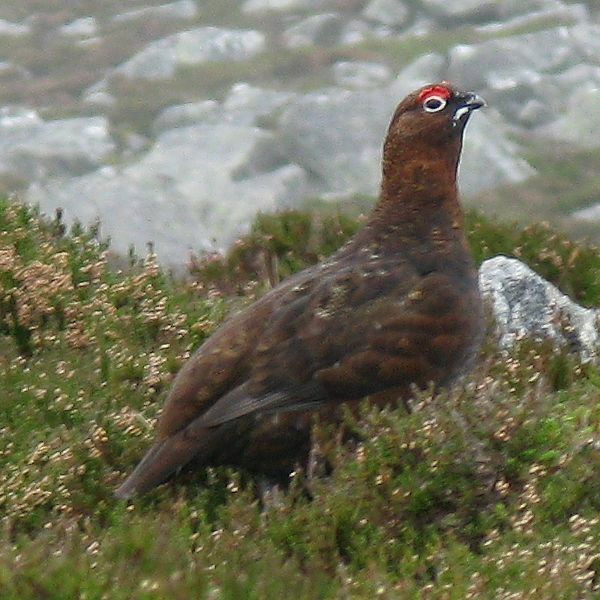 There had been loads of red grouse gobbling away all morning. These were my first closeish decent views and pictures. 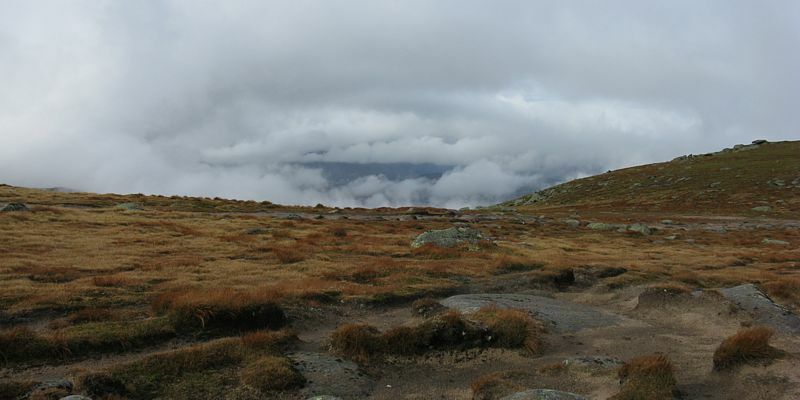 Shots of the cumulus billowing past behind me as I approach the stratus layer at 900 metres. 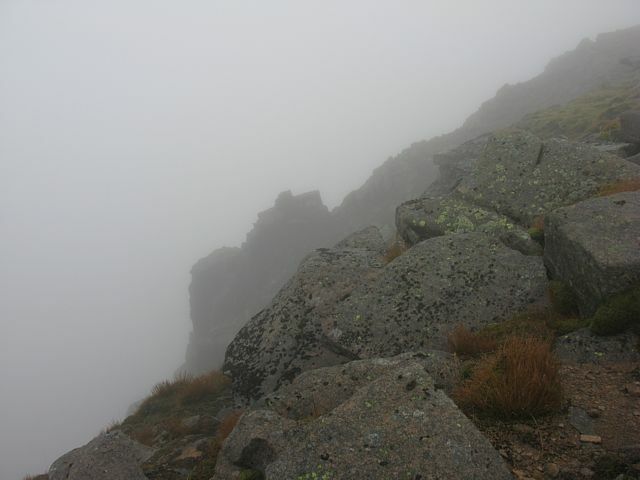 Now in cloud, looking at Meikle Pap from the baleach below it. 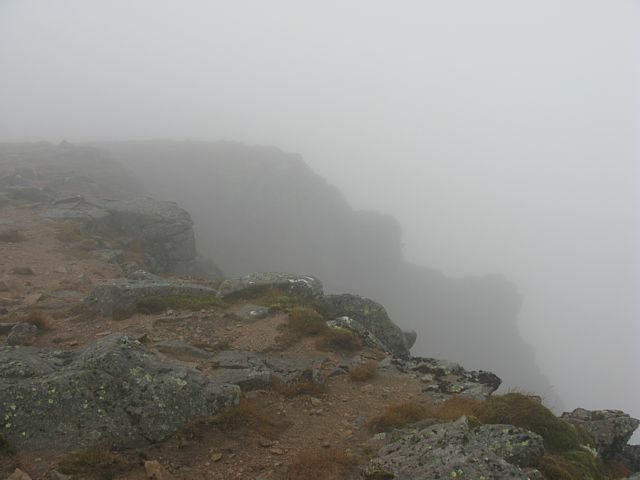 My view down to the loch is not a good one in the cloud. 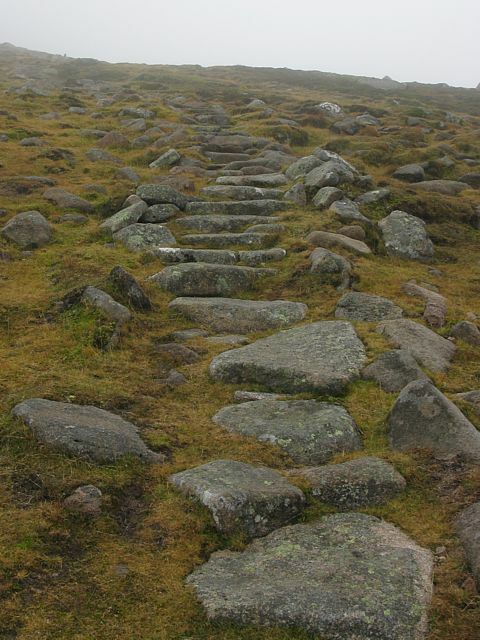 The staircase that took me up to the Lochnagar summit plateau. 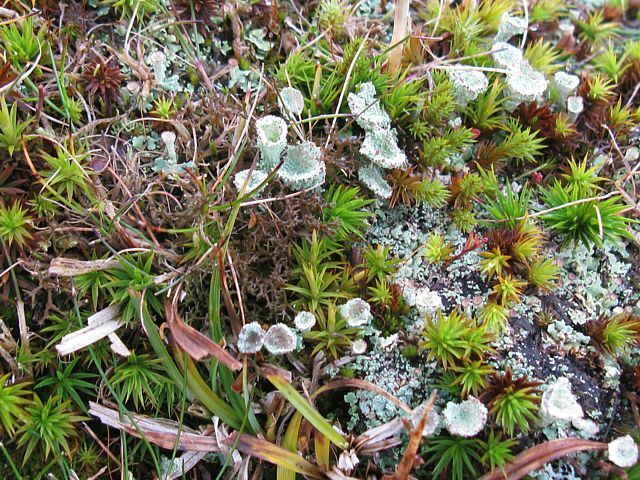 Macro shot of some mountain plant life. 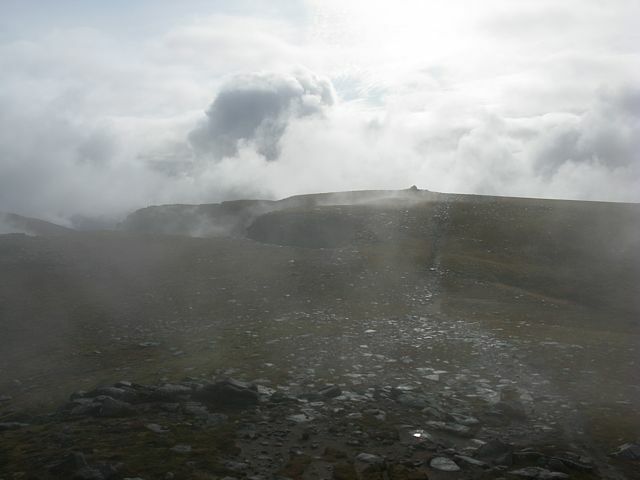 Looking behind from the staircase as a small gap in the cloud allows a clearer view of the baleach. 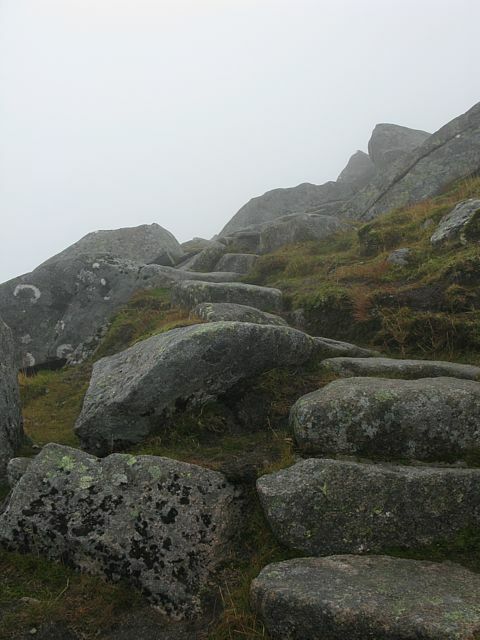 The staircase continues up through a boulder field. 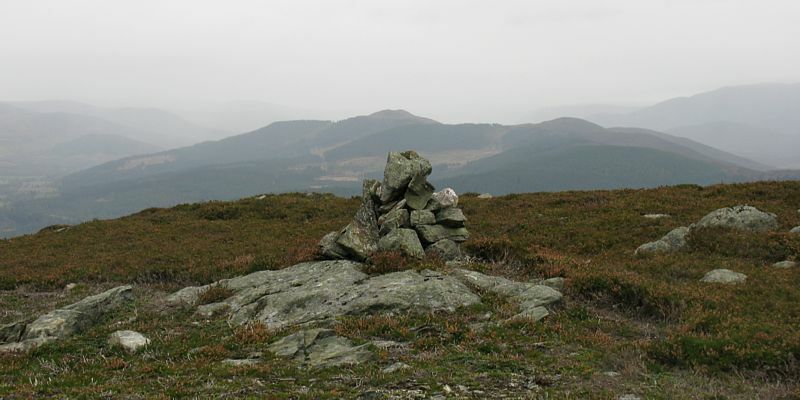 The Eastern end of the summit plateau. 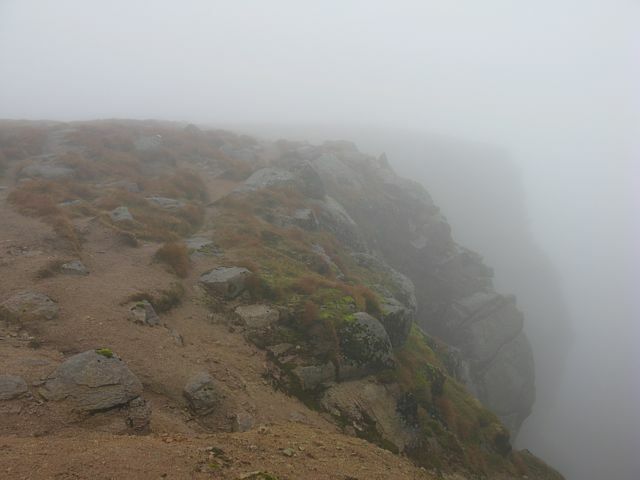 Even in cloud it's obvious there is a big drop on my right. The cloud and lack of wind makes it seem rather eery. 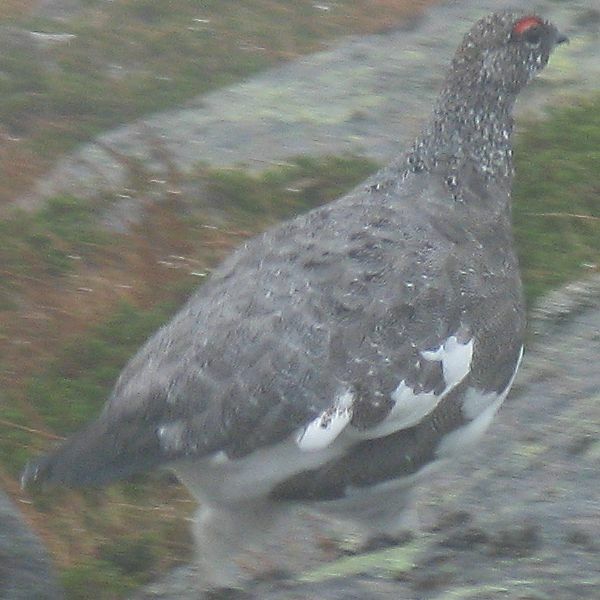 There are Ptarmigans on the summit plateau! Whole flocks of them. 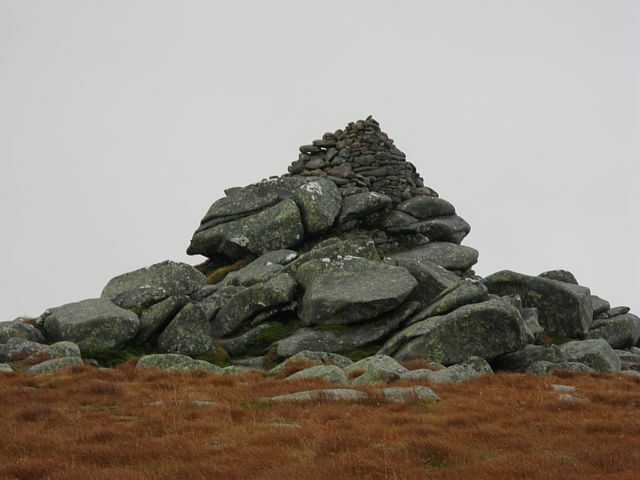 The boulder pile marking the summit of Cac Carn Mor. 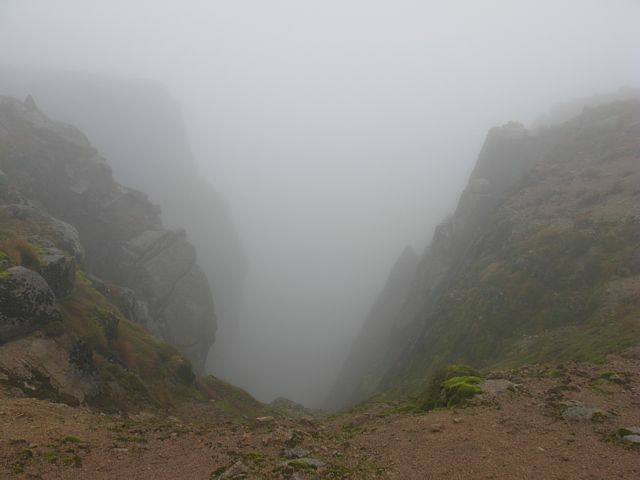 Some more spectacular cloud shrouded cliffs. 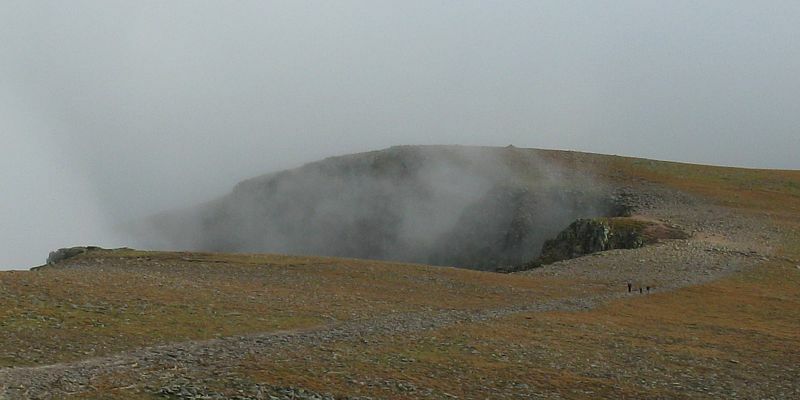 The summit, Cac Carn Beag, looming out of the cloud as I approach from the South. 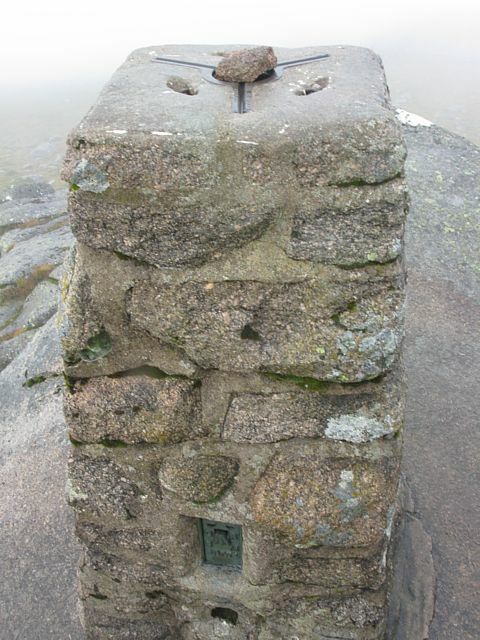 A plaque at the summit put in place 85 years ago! 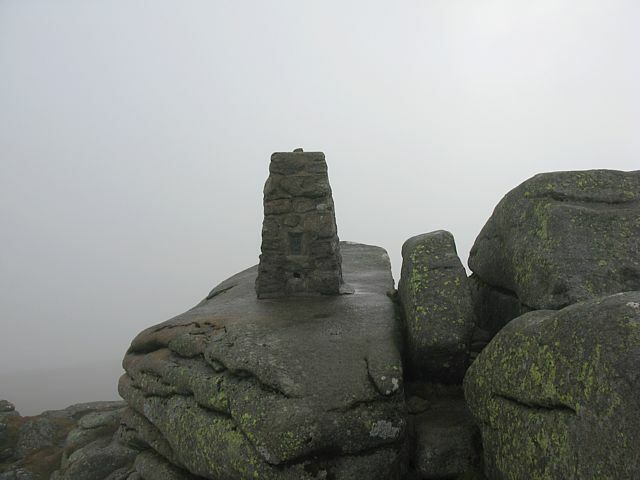 The O/S triangulation pillar at the summit. A closer look at the O/S triangulation pillar. The plaque from the O/S pillar. The sun starts to break through a little. 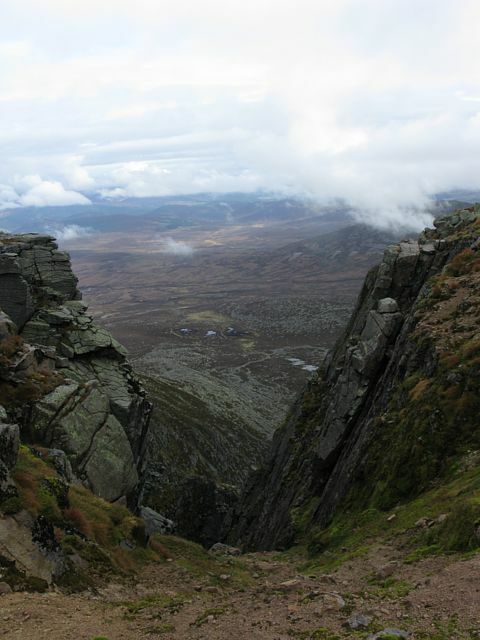 Looking back the way I came to Cac Carn Mor. And then the wow moment arrived! A hole materialised in front of me. 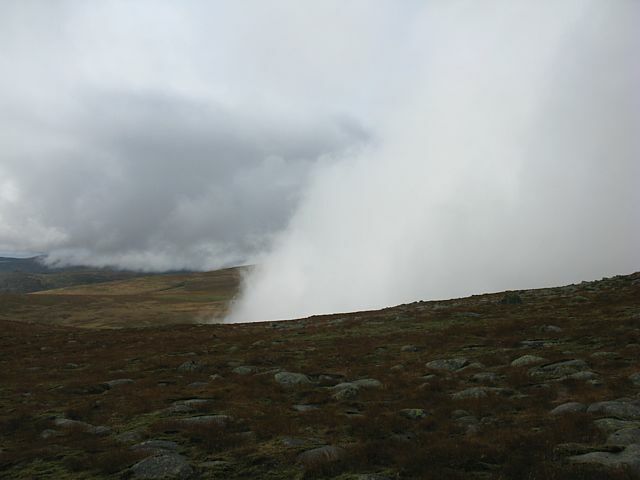 The hole grew rapidly bigger as the cloud seemed to dissolve around me. 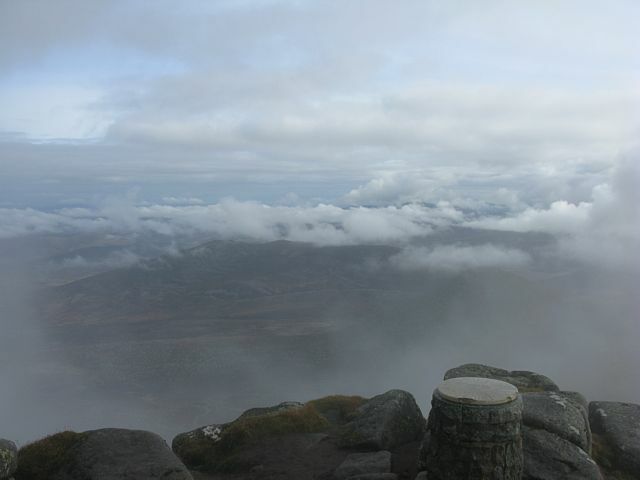 As the cloud continues to dissolve I can now see Cac Carn Mor and surrounding landscape to the NW. 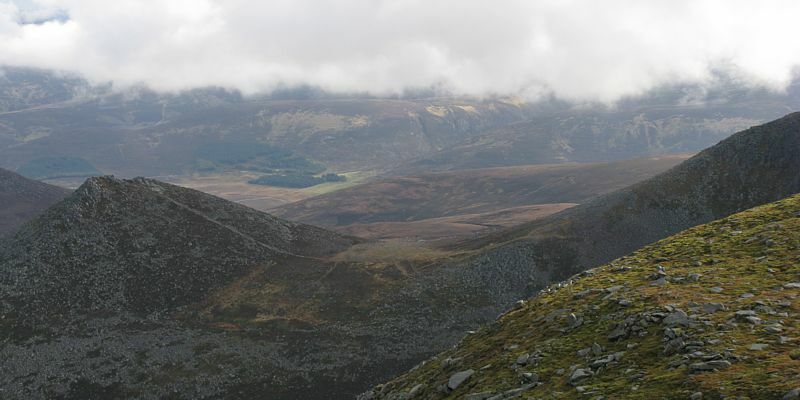 A 360 degree panorama taken at the summit of Cac Carn Beag, Lochnagar. 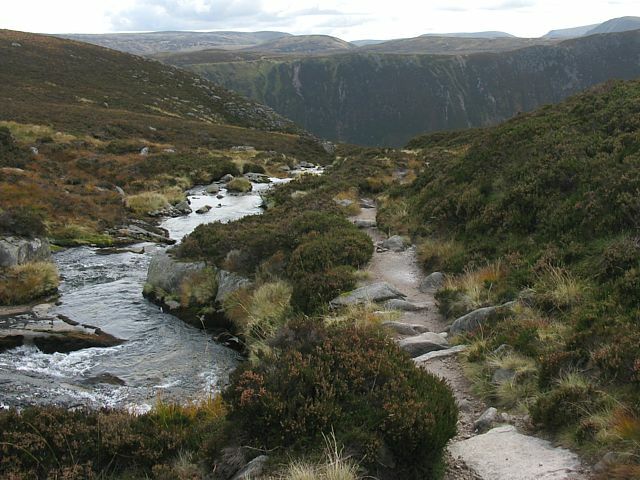 The path back to Cac Carn Mor is centre and SSE. 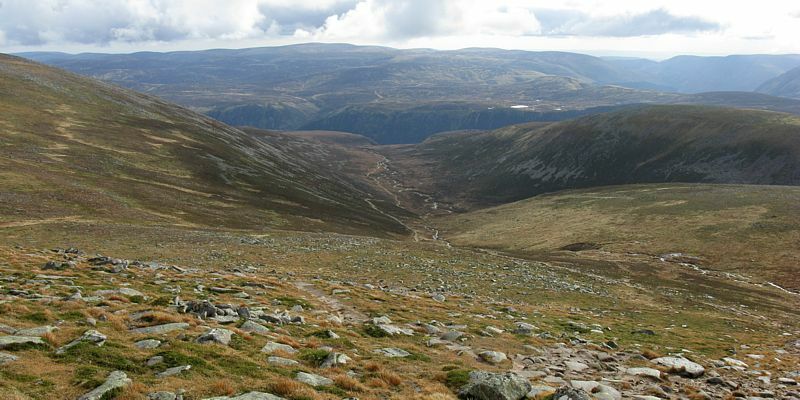 Deeside is to the North, and Loch nan Eun is WSW. You can see the ridge descending to the NW. Looking back to Meikle Pap I can see it is a fair way below me now. That start car park is tiny now. 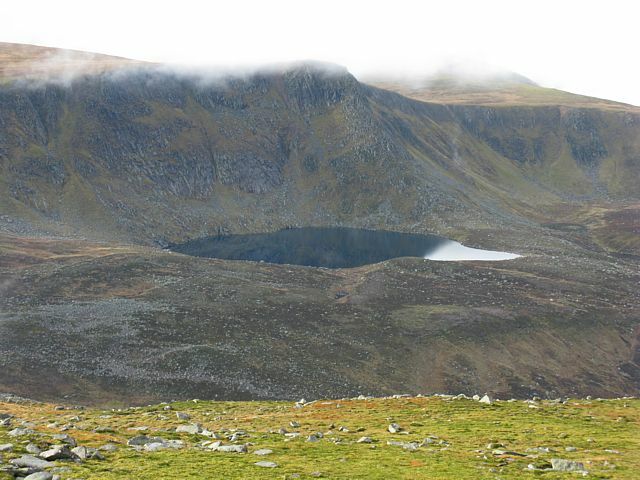 Cloud billowing around Coire Lochan nan Eun. 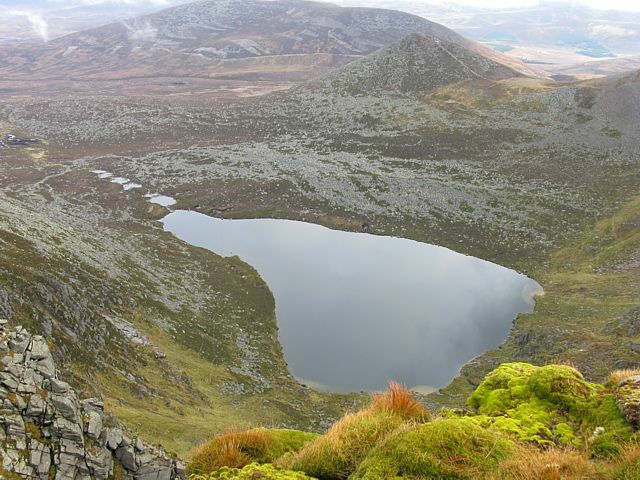 Lochan nan Eun. 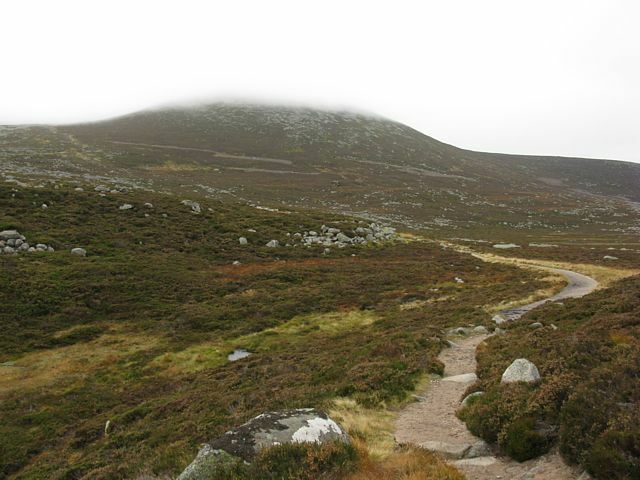 Walking back along a now clear path to Cac Carn Mor. 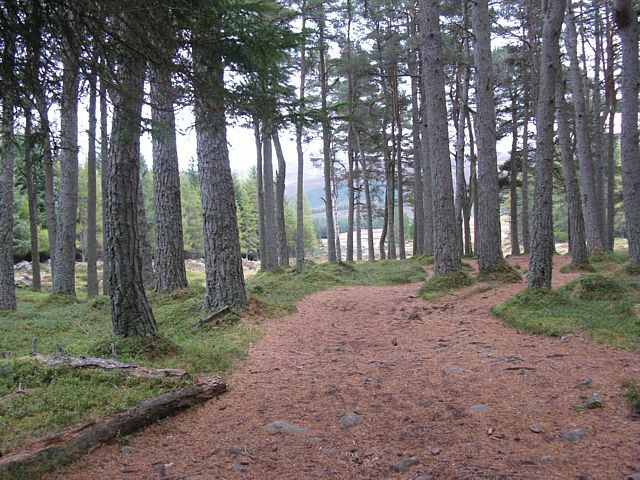 Looking back to the start point, the wood at Spittal of Glen Muick. 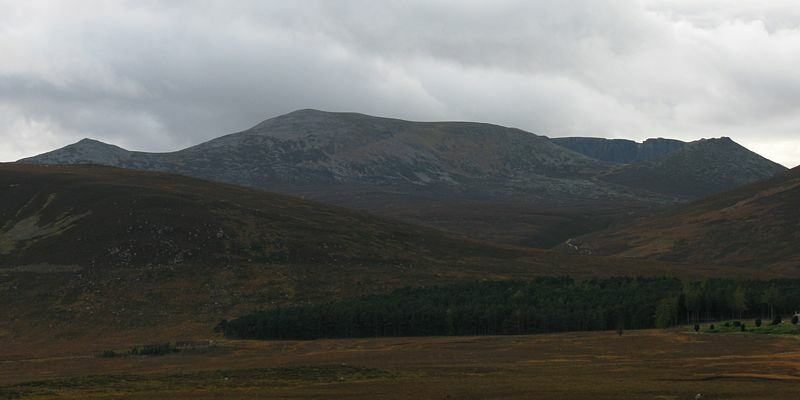 Looking South as I double back past Cac Carn Mor. 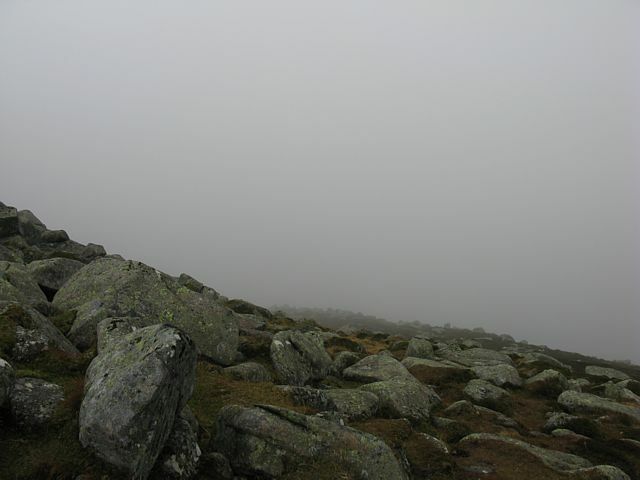 Without the stratus I can now see Lochnagar itself! 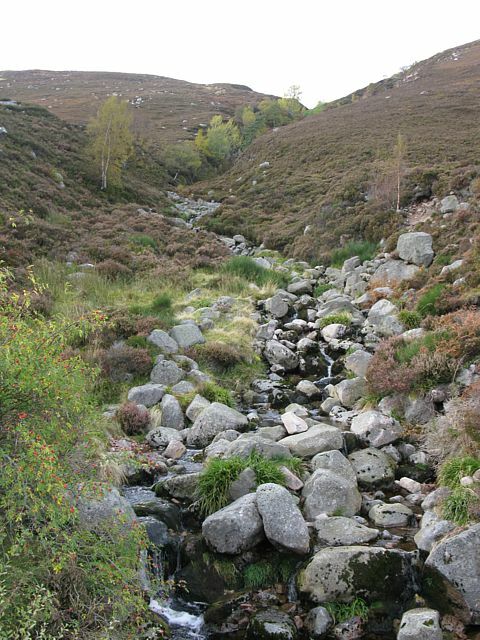 Here is the source of the water for Royal Lochnagar whisky. The cliffs now reveal their true magnificence in the clear air. 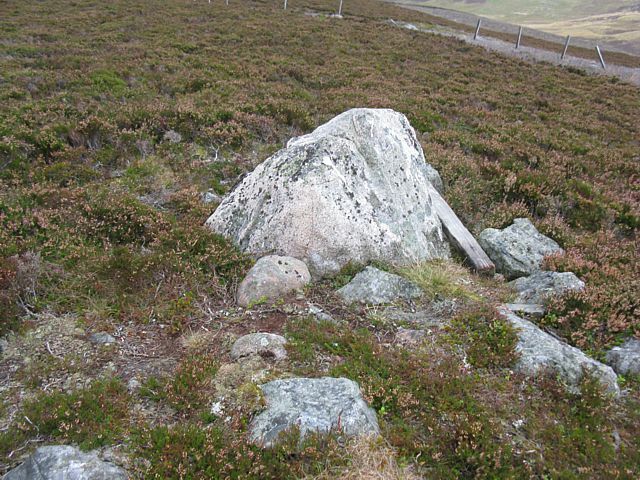 The Cac Carn Mor summit boulder pile in clear air. 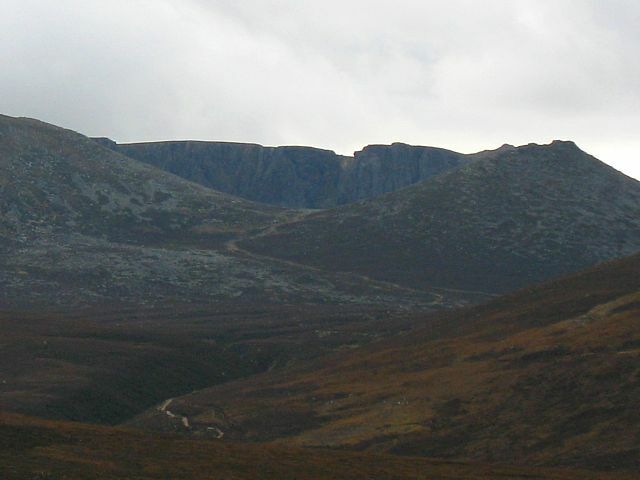 A closer shot of Lochnagar. In the still air clouds can be seen reflected in its still waters. 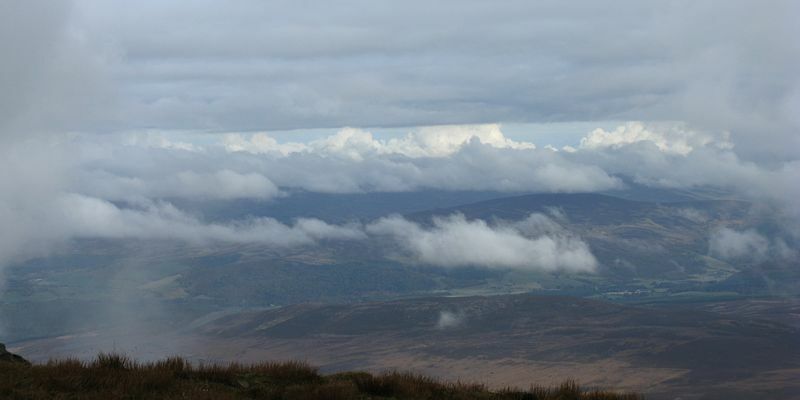 A couple of cloud shots looking North towards Deeside. Compare with img_3989 how the view changes when the cloud is taken away. Cumulus billowing up from below behind me to my Southwest. 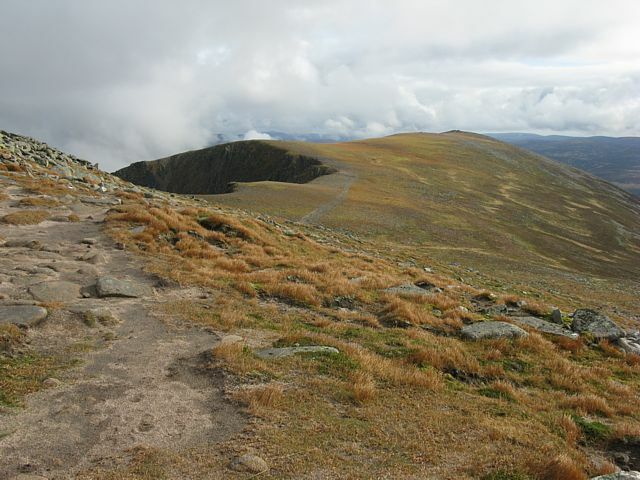 Looking back along the summit plateau from the Southeast slope of Cac Carn Mor. 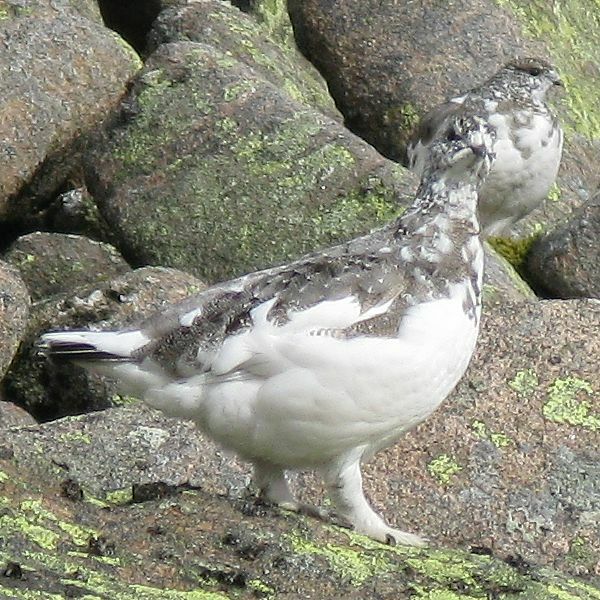 At about 1050 metres on the slope of Cac Carn Mor, I found a flock of Ptarmigans on the rocks. 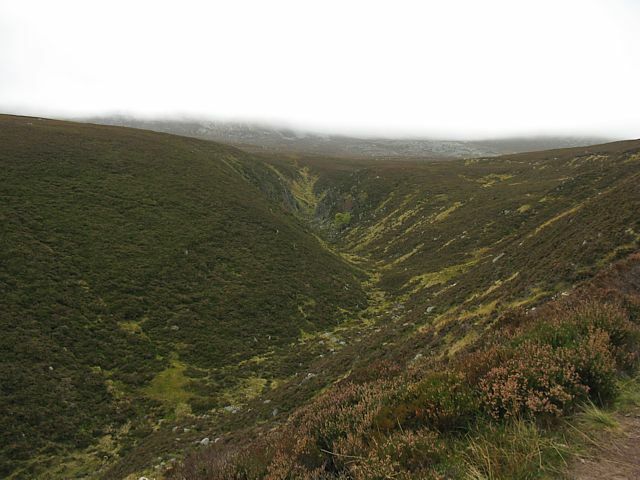 Looking Southeastwards down Glas Allt to a gash in the landscape far below that contains Loch Muick. 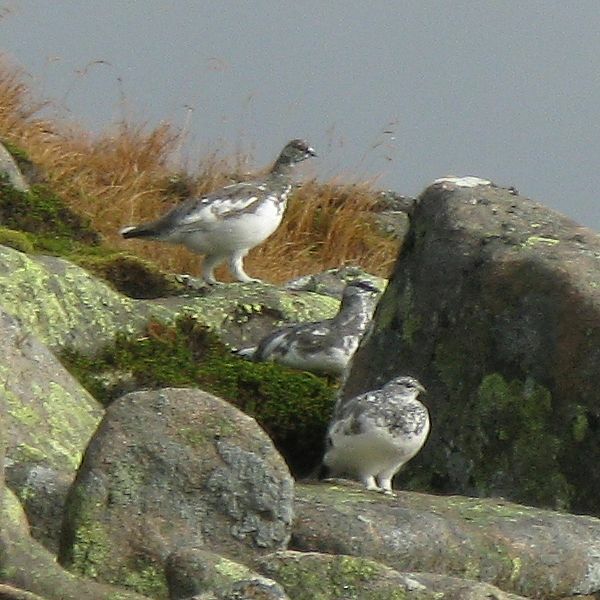 The rocks I nicknames 'Ptarmigan city'. 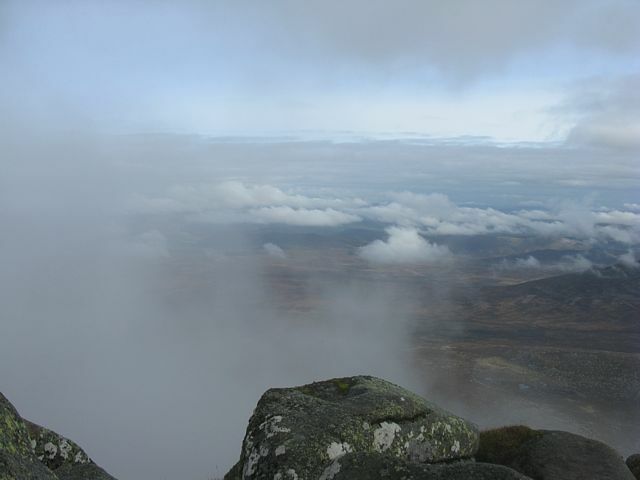 Looking over to the Eastern plateau as cloud starts billowing up from below. Almost volcano like. 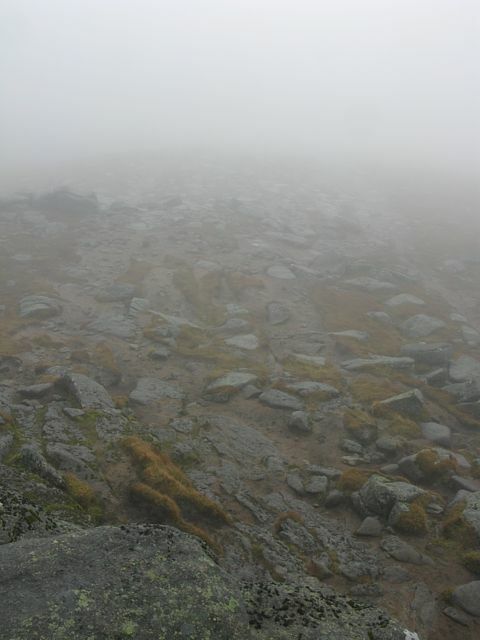 Meanwhile other walkers are now on the plateau. 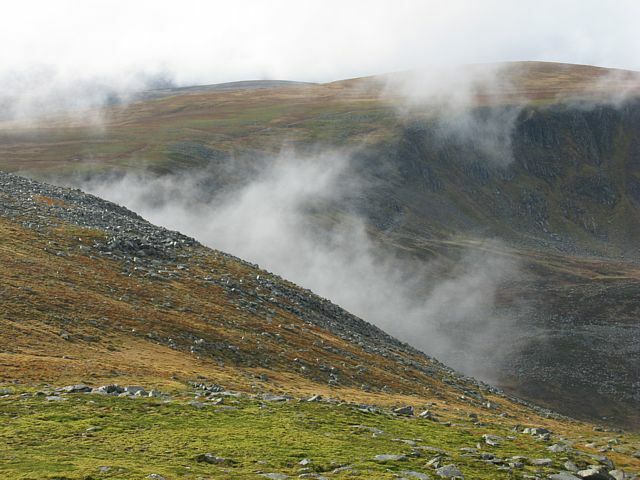 Descending alongside Glas Allt as cloud billows across the path behind me. 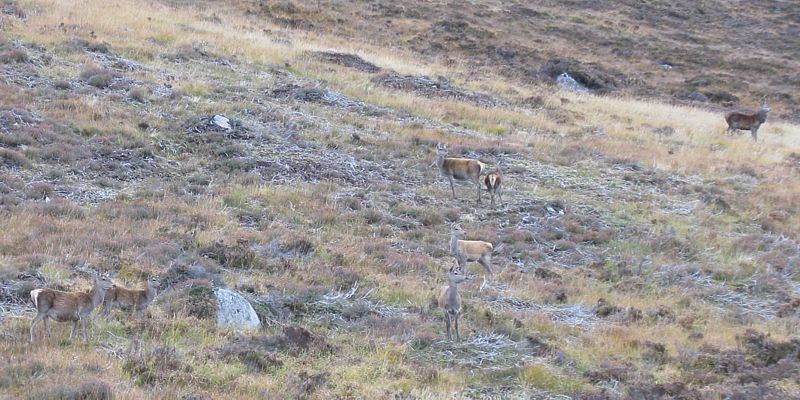 Deer on the southwestern slopes of Cuidhe Crom and Little Pap. Approaching the drop off into Glen Muick a bridge crosses the stream and the stream appears to vanish over the edge! 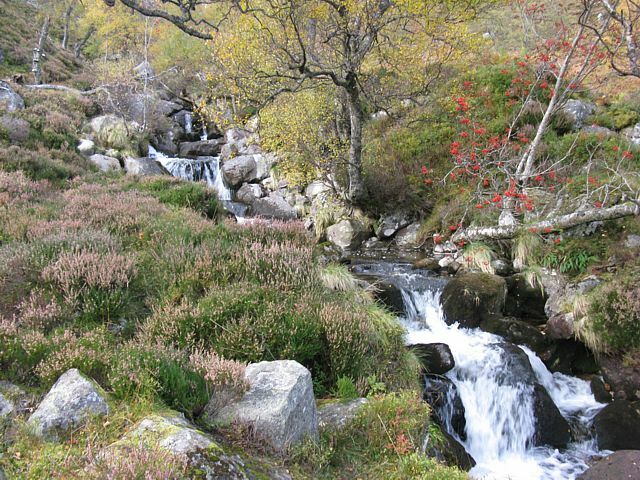 The lower part of Glas Allt is stunning, with waterfalls everywhere. 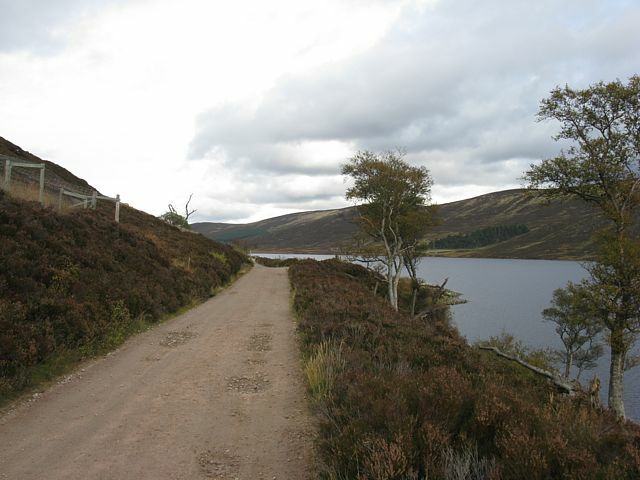 My first view of Loch Muick as I approach the drop off. Those waterfalls are getting bigger. The big one! 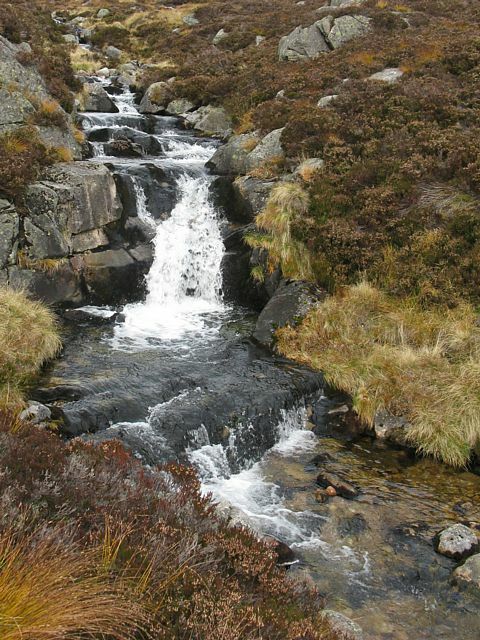 This waterfall alone makes Glas Allt worth exploring. The cherry on the cake to complete the walk spectacularly. 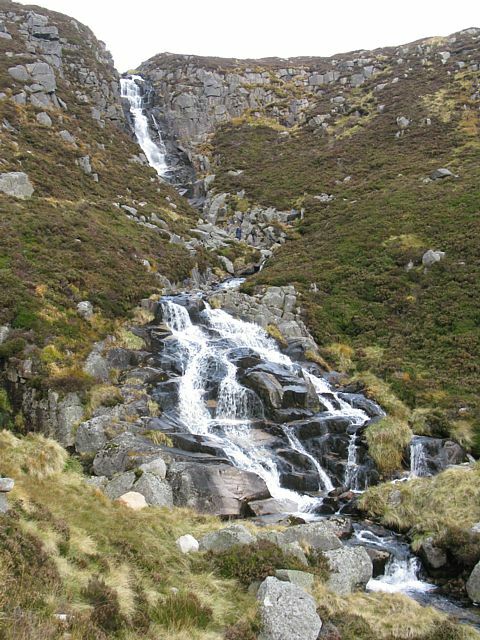 More views of the Falls of the Glas Allt as I descend towards Loch Muick. An arty shot of trees silhouetted against the sky above me. 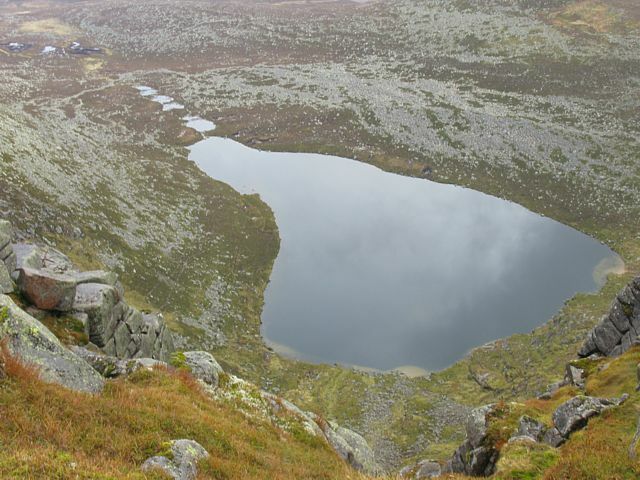 Glas-allt-Shiel is now visible below me. 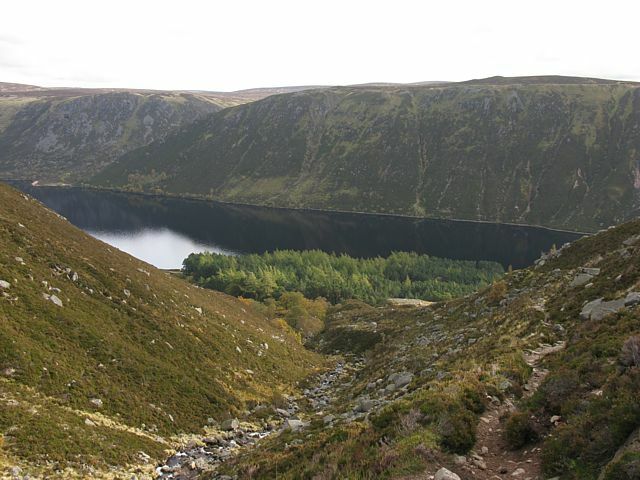 A 9 nshot panorama of Loch Muick from the slopes just above Glas-allt-Shiel. 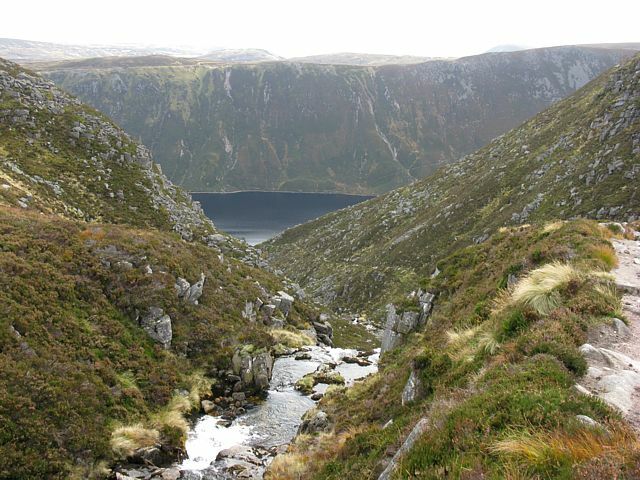 Glas Allt flowing into Glas-allt-shiel before it ends at Loch Muick. Looking back the way I came it looks rather inconspicuous from down here. 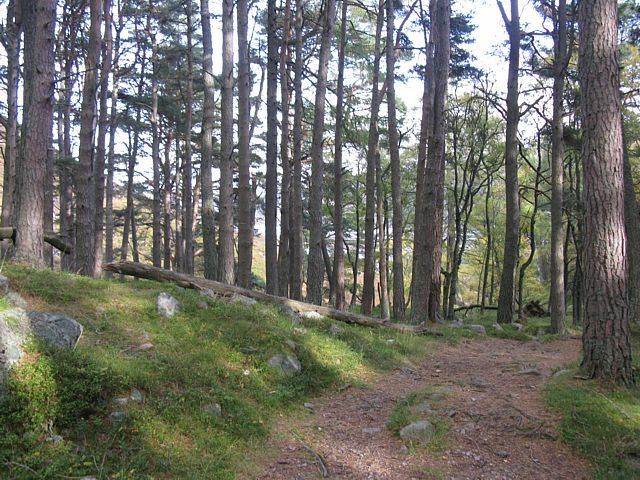 The woods of Glas-allt-Shiel. 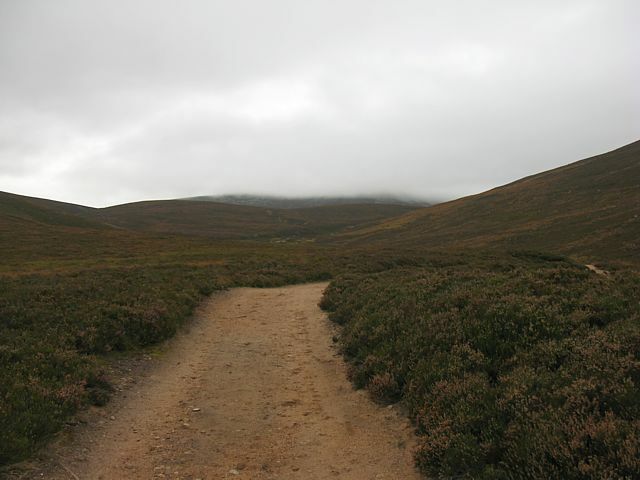 Loch Muick looks quite different in clear air. Last time I was here there was low cloud shrouding the cliffs. 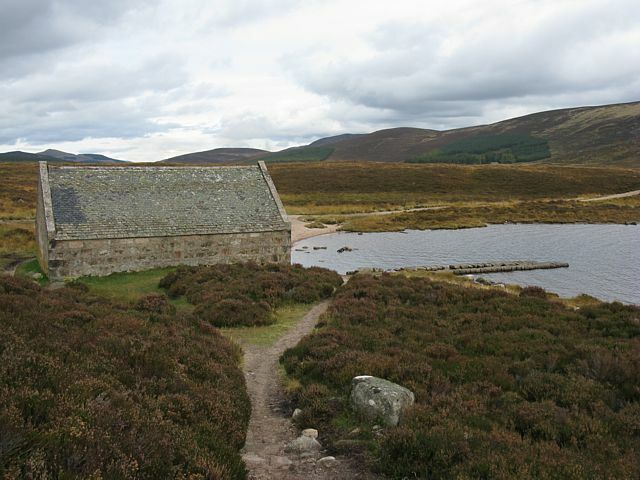 The boat house at the Northern end of Loch Muick. 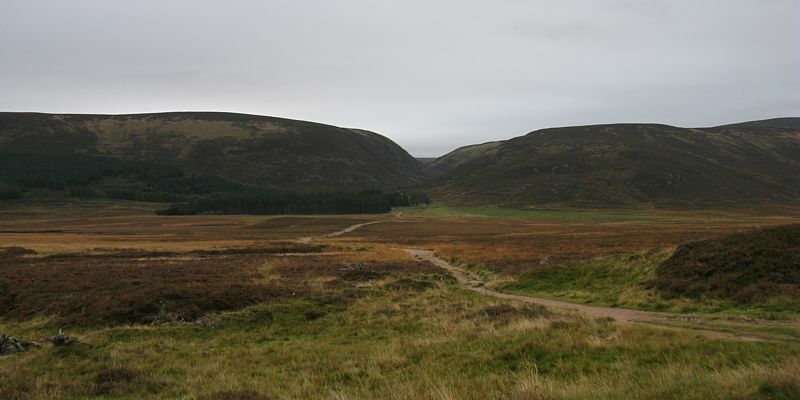 A 6 shot Loch Muick panorama from the northern shore. 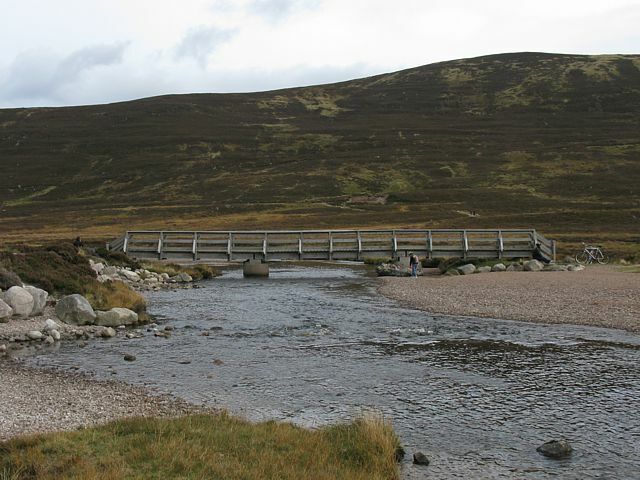 The bridge over the river Muick I need to cross to get back to the car. Now East of river Muick again, looking back to Allt-na-giubhsaich from the Souitheast, in daylight rather than twilight of the beginning of the walk.  As I complete the walk and depart in the car I get a view that the cloud prevented me from seeing when I ascended. If there had been no cloud then I would have had a magnificent view of the northern Corries of Lochnagar from the glen below. Fortunately, with suffiecient zoom I was able to capture the cloud free view from the roadside. 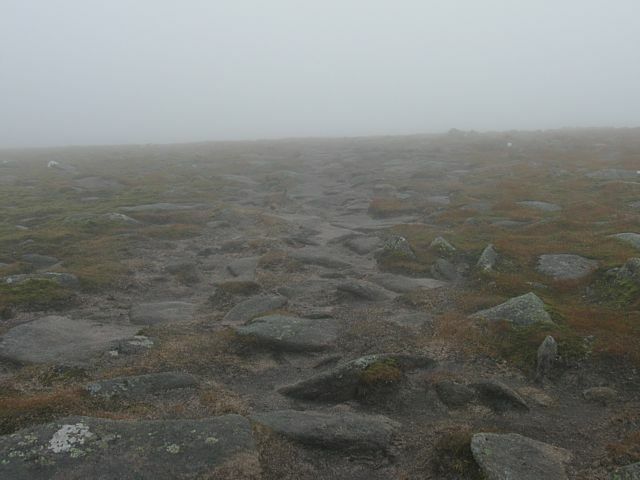 You can even see the track which I walked along past Clais Rathadan and up the mountainside too. 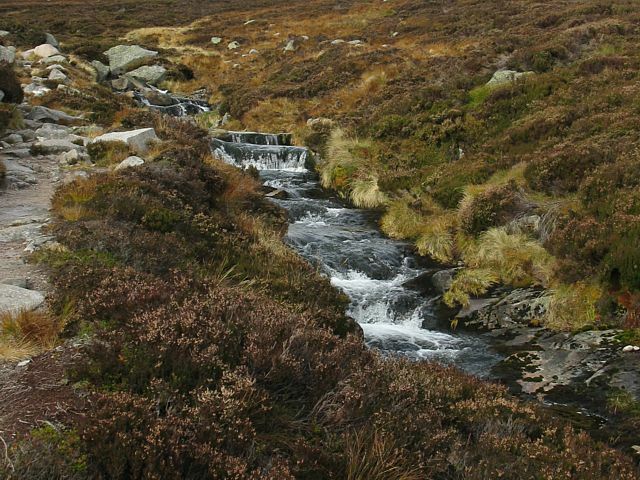 Link to videos taken as I walked down along Glas Allt. Please click here to go back to Scotland 2009 Page 2.